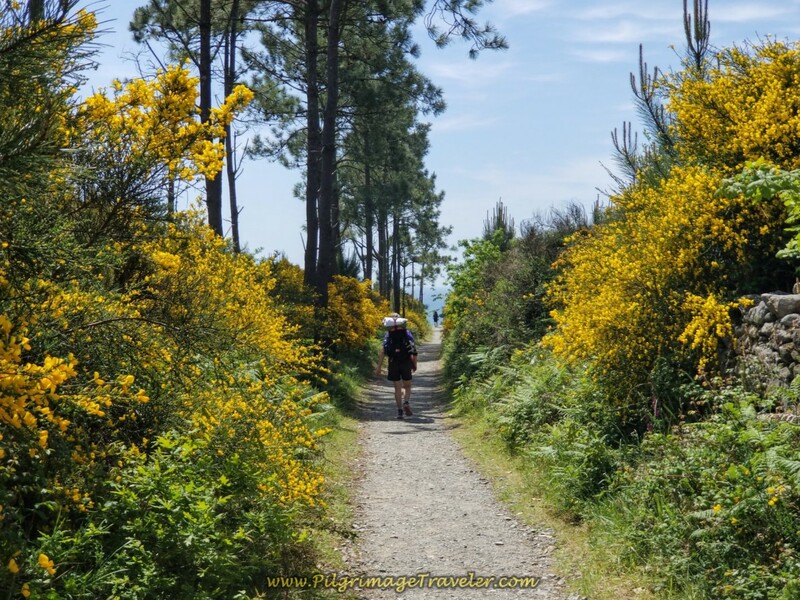 Day three on the Camino to Finisterre is a rewarding and lovely challenge, a most joyous walk with amazing views as you approach the Costa da Morte. 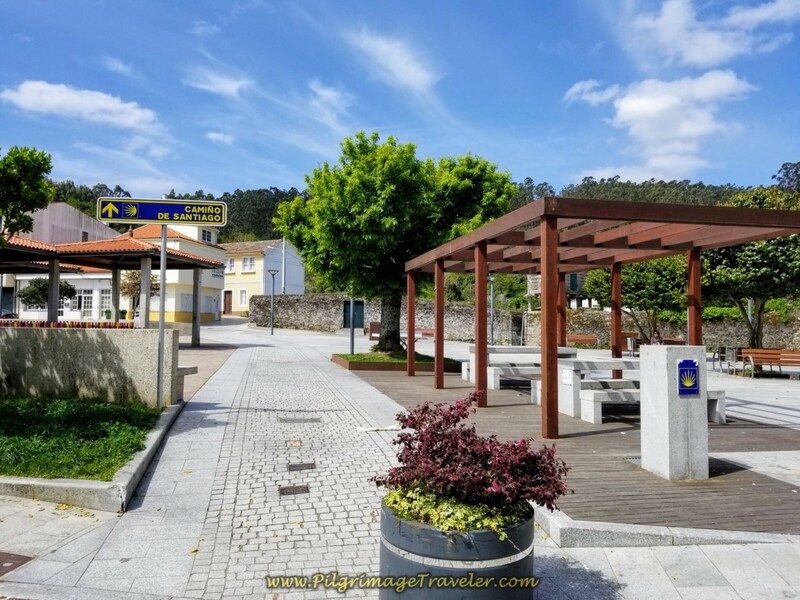 This day's adventure will take you all the way from Olveiroa to the cross in Finisterre, just beyond the wonderful Langosteira Beach (Lobster Beach), as you enter town. Now you may not like everything that Neitzsche says (and I take a risk quoting him here), but you gotta love this particular quote! Here is our Google map, created from our GPS tracks. As usual, I placed all the services on the map that a pilgrimage traveler needs. It will help you to plan your day. 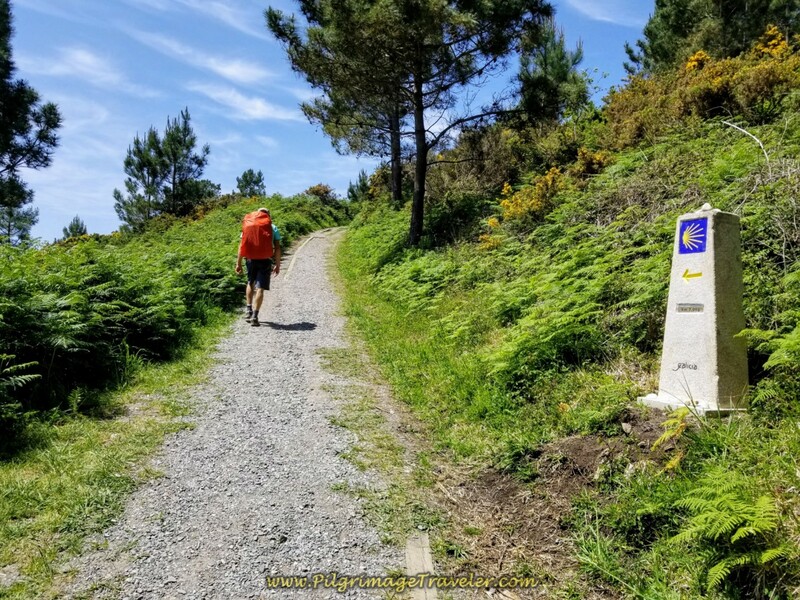 There are long stretches on day three of the Finisterre Way that have no services, and from Cée onward there are many! 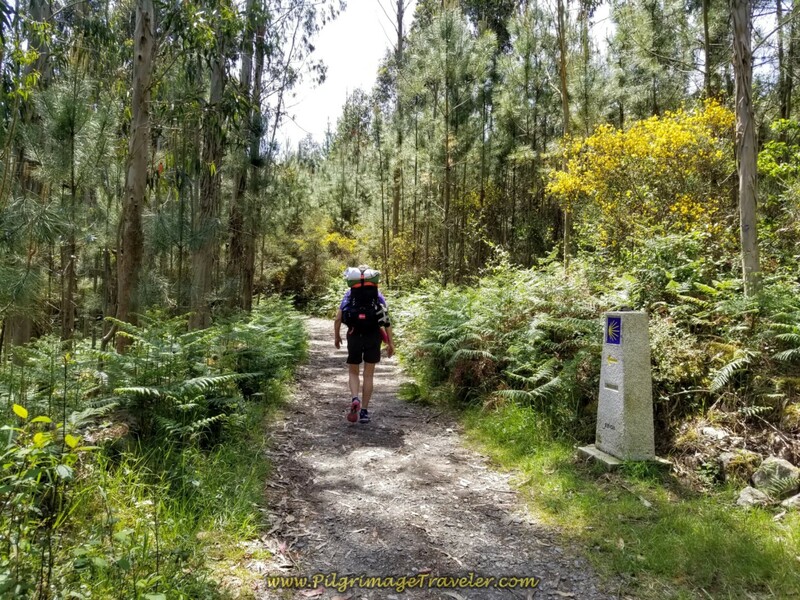 I always advise pilgrims to keep snacks and plenty of water in their packs at all times, because you never know what will happen on the Camino. Hunger and/or thirst equals misery in my world! The length of day three at 31.6 km is significant, however, to me it actually felt less strenuous than day two because of the lack of sustained and lengthy hill climbs. Plus there are the many distractions along the way, churches, fountains and sea views abound. Here is our elevation profile for the day. 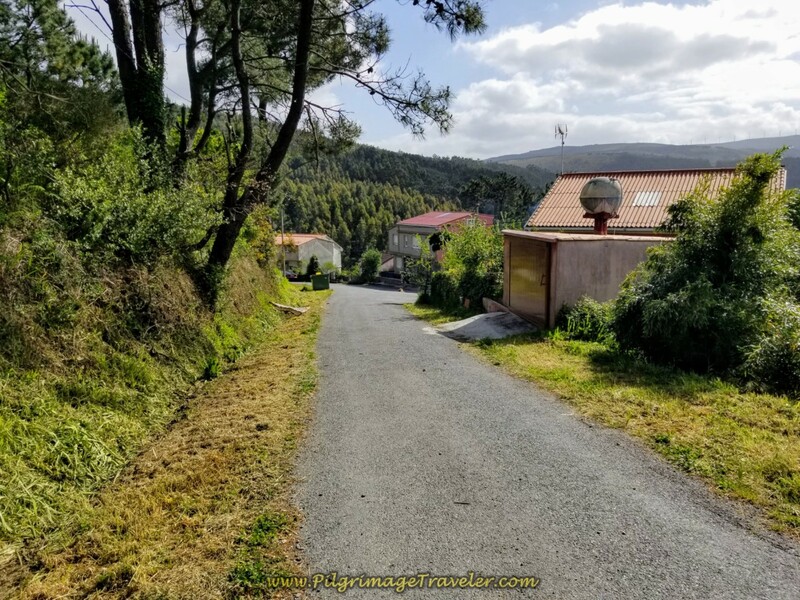 As you can see, the drop from the lofty heights that we were traveling on day two, is dramatic as the Camino Finisterre heads to the seacoast in Cée. There are several small climbs after Cée but they are short, though steep. Cée or Corcubión are both appropriate stopping points to make a shorter day, at about 20 and 21.6 kilometers, respectively. We got an early, just post-dawn start out of Olveiroa. The Casa Loncho, our starting point serves breakfast starting at 6:30, so if you are staying somewhere without breakfast, you could get it here. They even serve bacon and eggs if you want it! 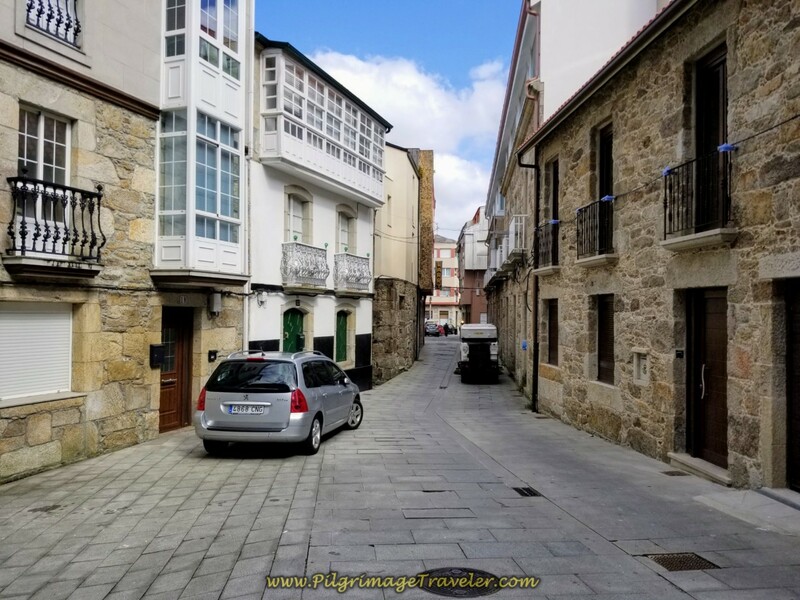 The Camino, leaving town walks through main street and all the historic, well-preserved old stone horreos. It is a lovely sight in the early morning light. In a total of 300 meters on the main road, a turn to the left is indicated, onto a path, at this 35.3 kilometer marker. It would be a long countdown for one stage! 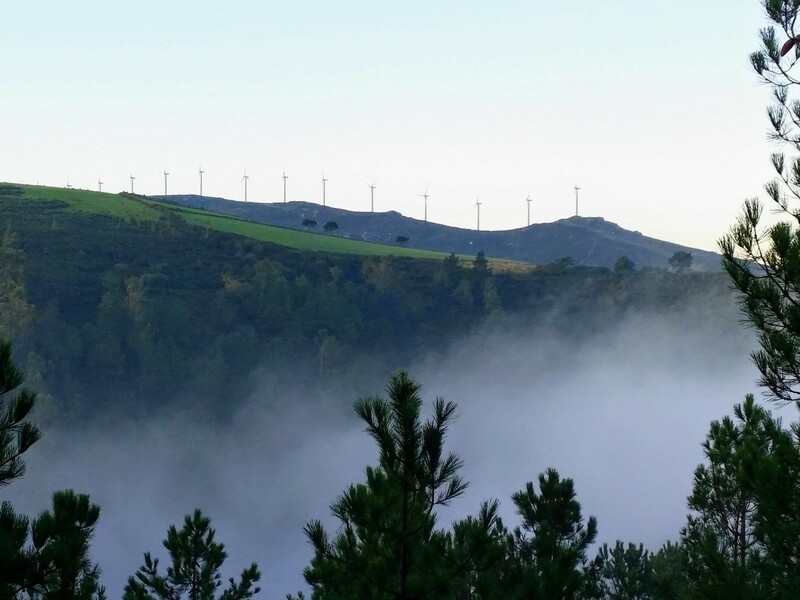 Immediately after the turn, a small climb of about 50 meters (150 feet) begins to a high ridge and the reservoir, the Encoro Da Ponte Olveira. This section begins by walking through the trees. 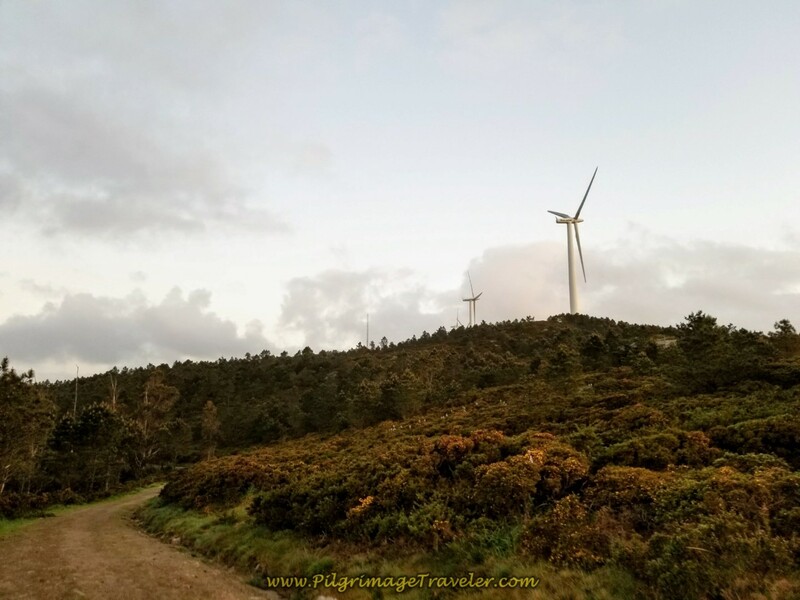 The climb follows a high power line, then it takes a sharp bend away from the power line and turns right at the 34.8 kilometer marker, heading toward the windmills on the ridge instead. It is a total of about 1/2 kilometer in distance at this turn, from the initial turn in Olveiroa. This is a wonderful and lofty place, that can be filled with early morning mist, as it was in Sept, 2014 when I first walked through here. The reservoir is in the valley below, and you will catch glimpses of it on your left shoulder along the way. Here is a throw-back shot. 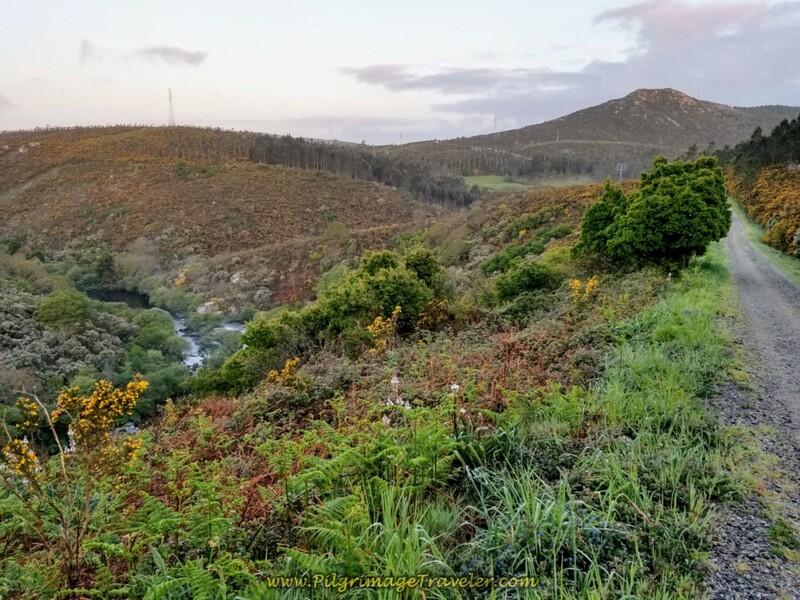 This is how the river valley of the Río Xallas looked in 2018 when we walked it this time. Clear and crisp in the spring with nothing more than a very subtle sunrise. It was just starting to green up in early May. 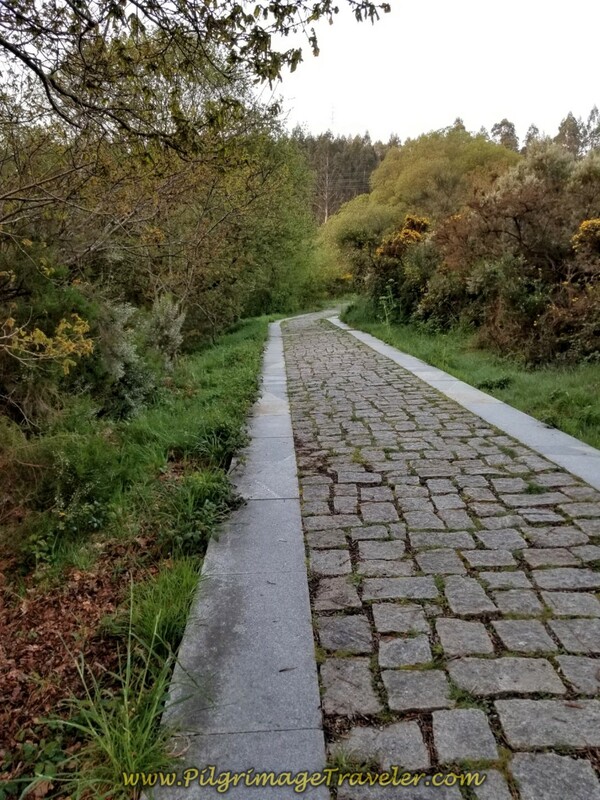 Once reaching the crest on the ridge, the Camino turns downhill again into the next drainage of the Río de Hospital. shown below. Just beyond the footbridge the Way is now a nice paved path, shown below. After a short steep climb out of the drainage, the pavers end at the next right hand turn, at kilometer marker 32.7, shown here. 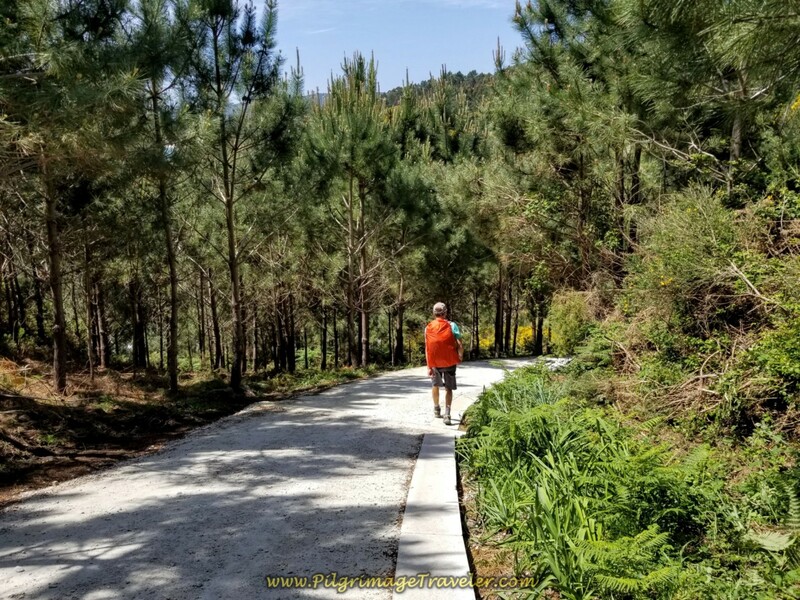 It is a full 2.0 kilometers following the Xallas River valley, before this right turn onto a gravel lane that heads northward to climb again toward the first town of Logoso, just 700 meters ahead. 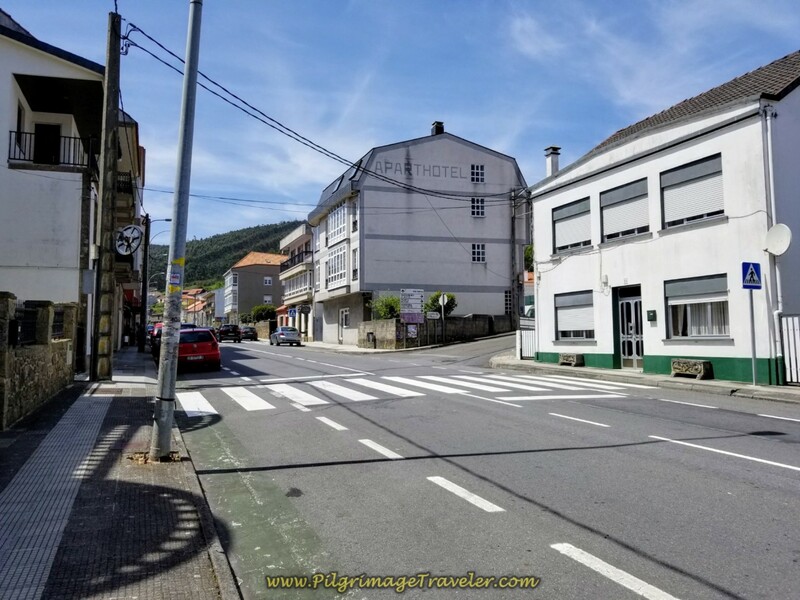 Come out into the town, and the prominent building ahead is the Albergue O Logoso. This is a quaint-looking place with pilgrims milling about as we passed by. 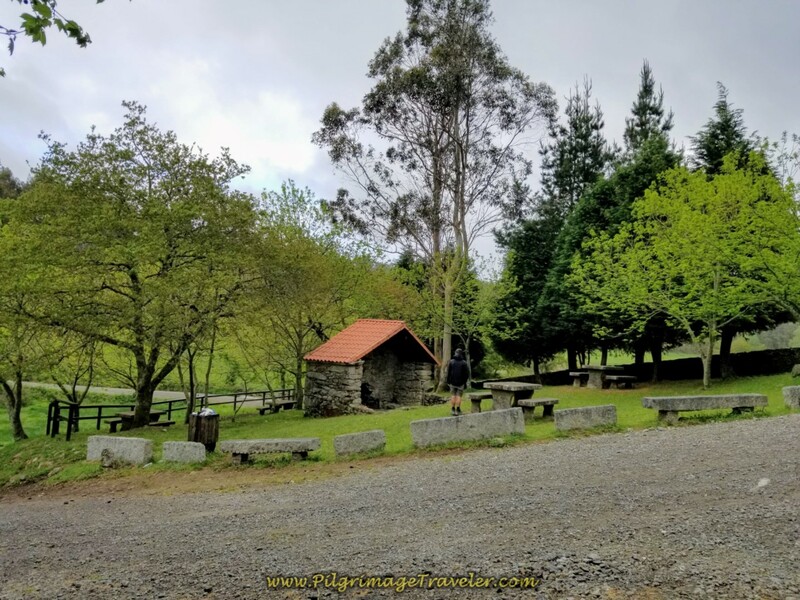 It is just shy of four kilometers from Olveiroa to Logoso. 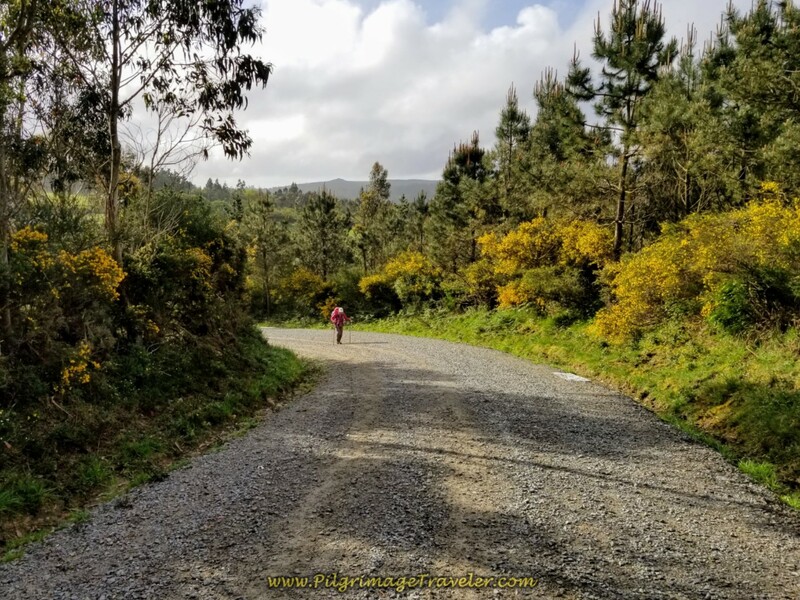 Onward, after walking through the tiny hamlet of Logoso, staying left whenever given the choice, you pick up another dirt road for a gentle climb of 80 meters (260 feet), shown below. 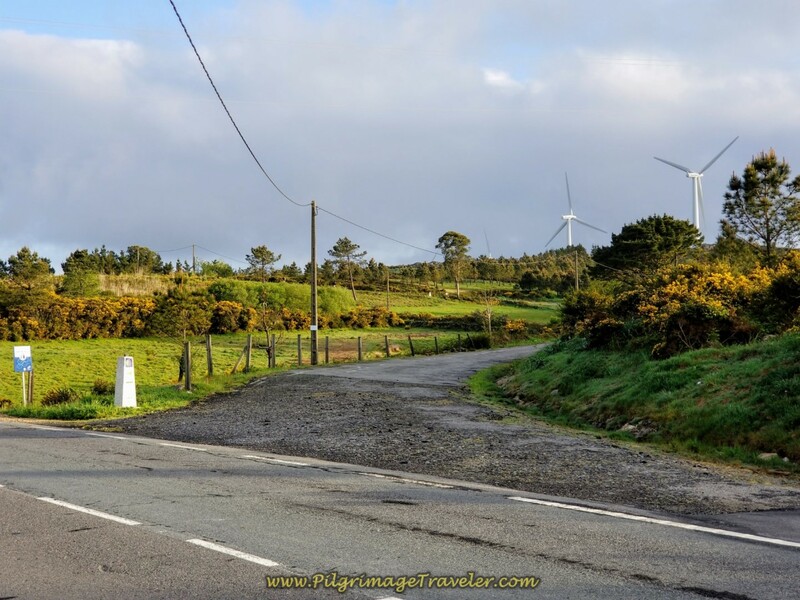 Eventually you will see the next town of Hospital ahead among the windmills! This is almost the high point of the day. When you arrive at the T-intersection in town, turn to the right towards the bright yellow building shown in the photo below. As the "hospital" name implies, this place once must have had a pilgrim's shelter, or hospital where they were fed and cared for, but no remains of it exist. 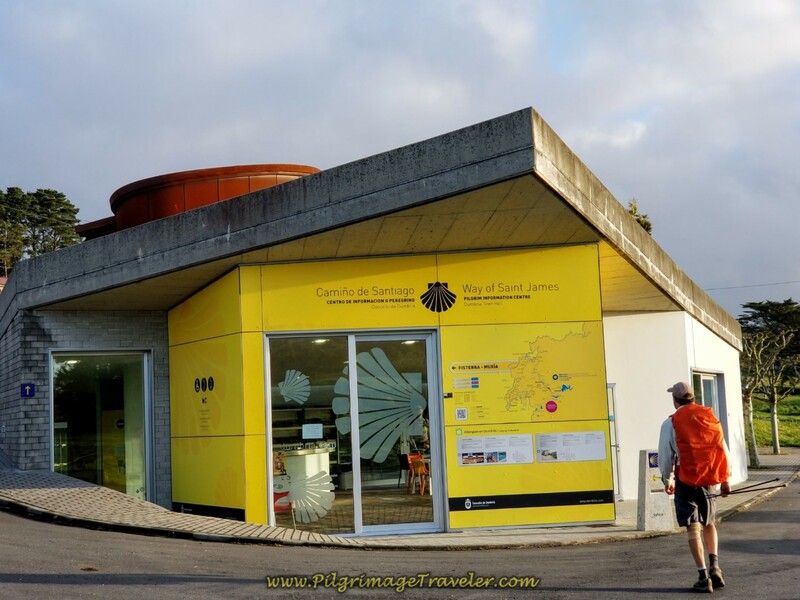 It is after about 1.5 kilometers from Logoso on the dirt road, and after 5.5 kilometers into day three on the Camino Finisterre, that you reach this bright yellow building, the brand-new tourist information center. We were astonished to see it open at 8:15 in the morning! We stopped for bus route information, and the attendant was super friendly, spoke perfect English and very knowledgeable! After the information center, on the intersection with the DP-3404, you turn left onto this main road. 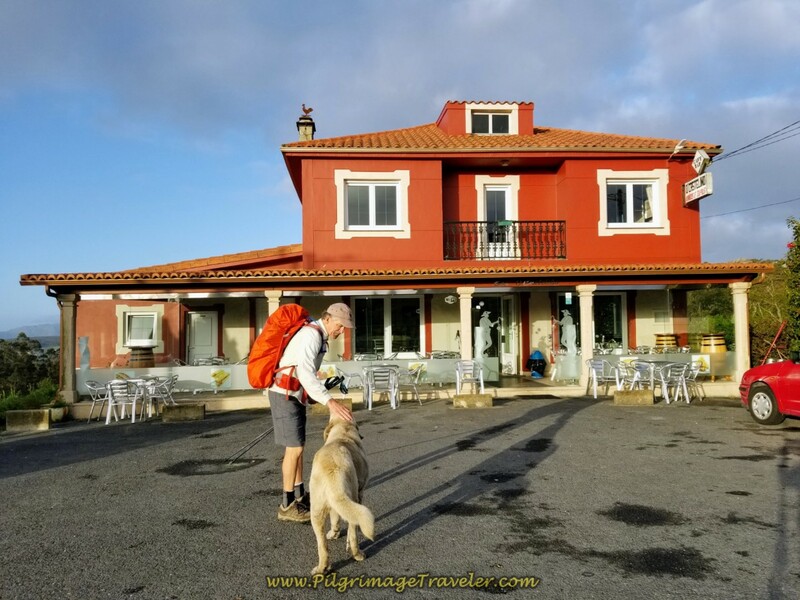 In 400 meters you come to the Café Bar O Casteliño with a very, very friendly dog wagging his tail and inviting you to stay and pet him for awhile! Now there is a sales coup if I ever saw one! Despite the friendly dog, with whom we stopped for a little lovin,' we carried onward. Just across the café is the right turn that you take, for a brief 400 meter diversion from walking along the DP-3404. Here is where the secondary road merges back with the DP-3404. When you see this sign, shown in the photo below, you know that the fork in the road is just ahead. Walk another 300 feet to the fork in the road, shown below, after about 6.2 kilometers from the center of Olveiroa. 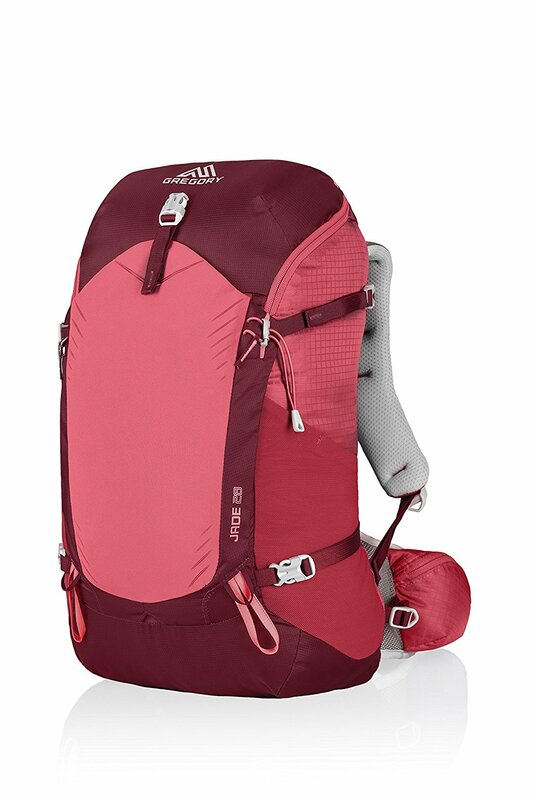 Here one has to make a decision whether to go onward to Finisterre, or to go northwest to Muxía. For us, it was an easy choice. 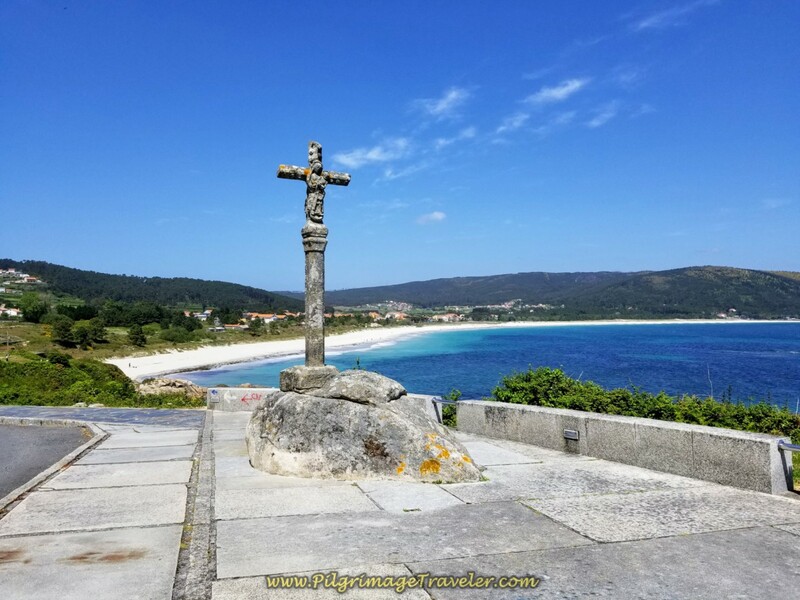 We needed to see the "classic" medieval End of the World, Finisterre. Regardless, we were planning to continue from there, to walk on to Muxía. If you are unsure of your decision and are short on time, please click on my information on both towns to make your own decision. 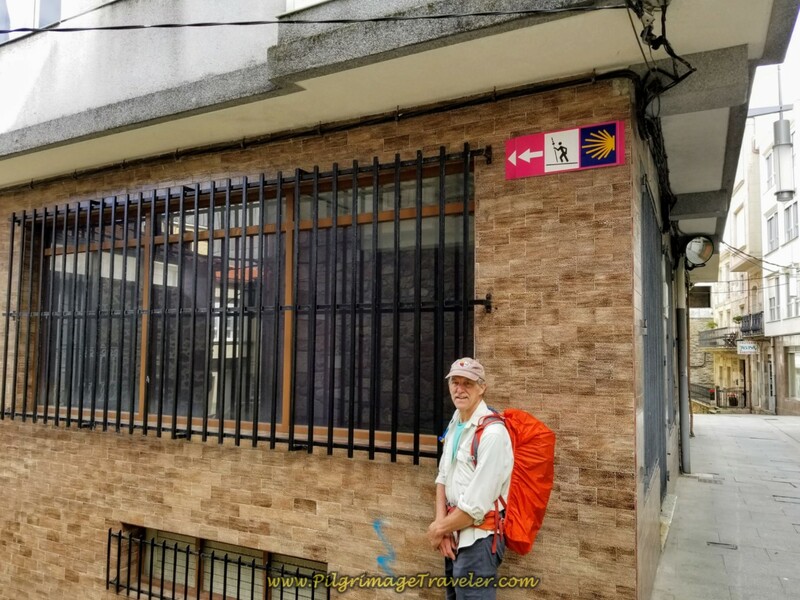 However, on another later Camino, we did take the Hospital to Muxía direction! It is also a lovely walk, one you will not regret. To see our day three on this route, click here. You can always do the entire loop if you have the time! 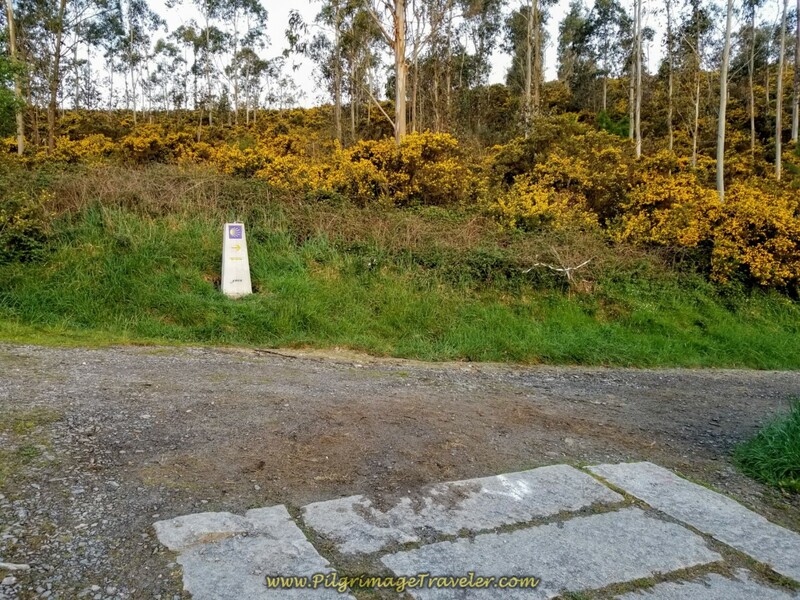 The brand-new kilometer markers show that to Fisterra it is 29.693 kilometers and the shorter option is to Muxía at 26.589 kilometers. My own GPS tracked it at 27.15 kilometers from Hospital to Muxía. Here you have reached the high point of the day at almost 400 meters in altitude. It is a long way down to the sea from here! 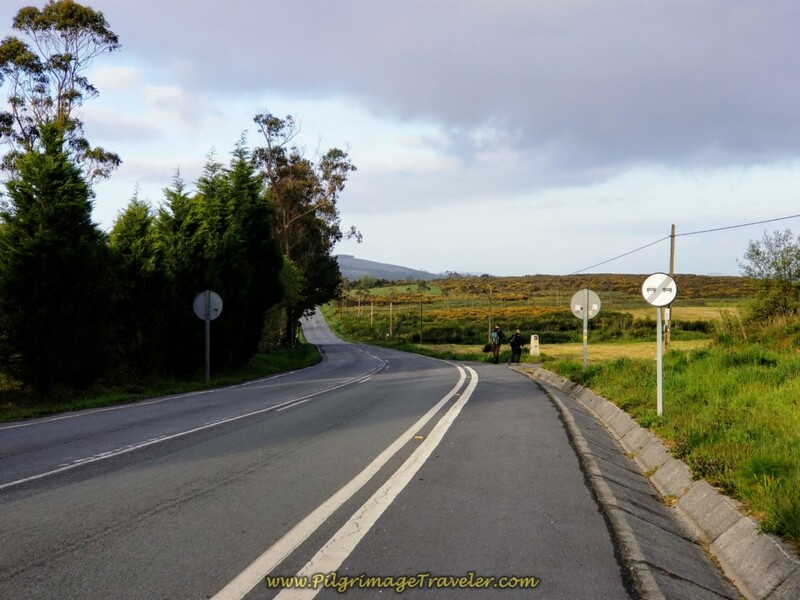 Turning left toward Fisterra, it is about a 1/2 kilometer walk on the DP-2302 for the pilgrimage traveler. Then it is a right at the waymark, shown below. The path leaving the DP-2302, shown below, is open and quite high! There are windmills in every direction. The vistas abound! 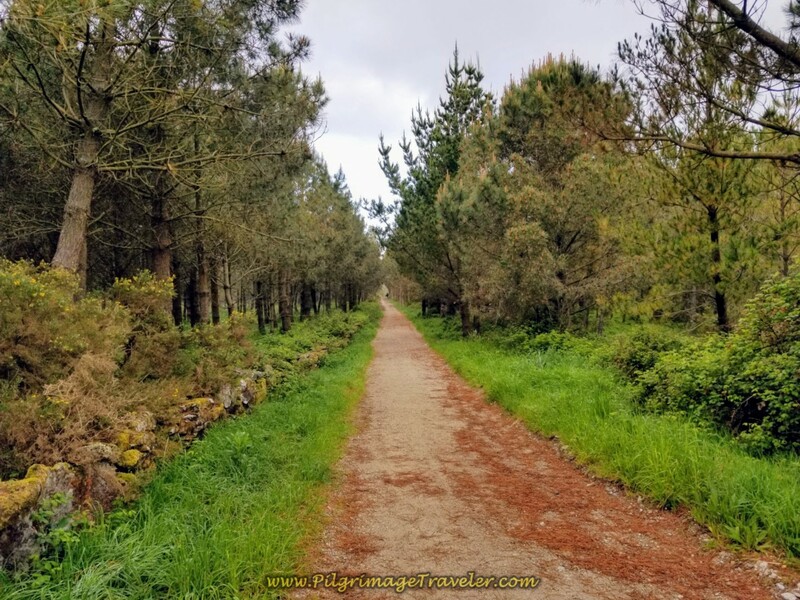 Day three to Finisterre is my favorite day on the Finisterre Way. "Splendors lying in wait," as Neitzsche calls it! We were lucky to have clear, albeit a bit cloudy weather to negotiate this lofty path! It is another 800 meters or so when the path enters a wonderful, shady forest. 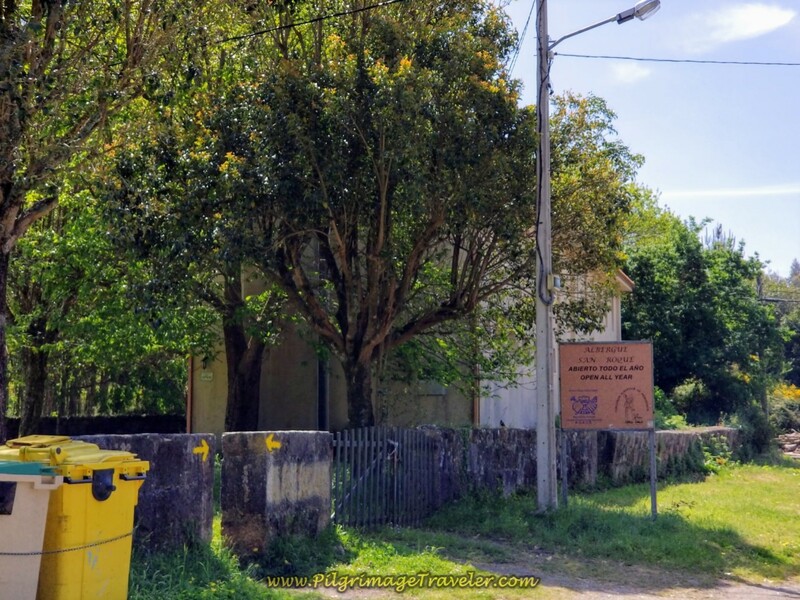 Where several roads converge in another 900 meters, you encounter this cruceiro, called the Cruceiro Marco do Couto. We paused, placed our stones and sent our own individual prayers for the journey. At this cross you are at approximately 9.0 kilometers into day three on the Camino Finisterre. We continued straight on past the cross on the gravel lane. 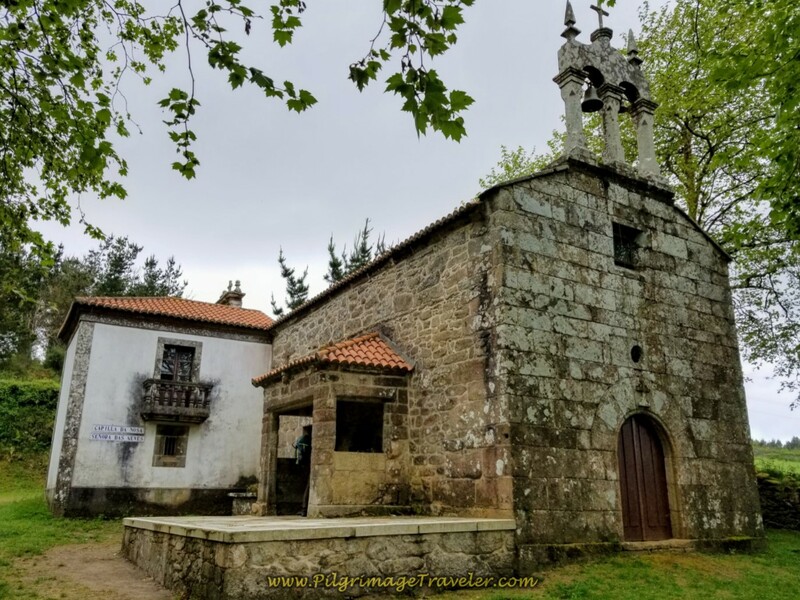 The Camino heads downhill, meandering through the countryside and opening up many more views, as it leads you toward the lovely Capela da Nosa Señora das Neves, 1.8 kilometers after the Cruceiro. This intimate little country chapel is a wonderful place to take a break, a third into your day at 10.8 kilometers. And fortunately, there is a lovely picnic ground and fountain, just across the road, shown below. You can fill your water bottles if you need. We paused here for about 15 minutes, eating a snack and enjoying the ambiance of the place. After our break, we passed the 25.0 kilometer marker by the chapel. 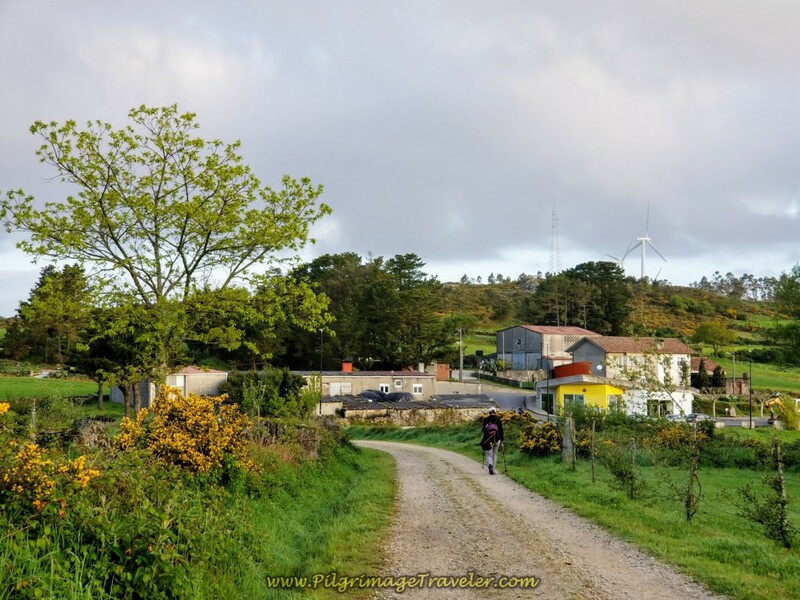 As we walked around a bend, coming up the hill we encountered a peregrina heading back towards Santiago. 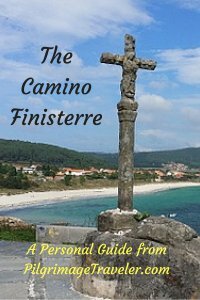 Many pilgrims actually walk to and from Finisterre as part of their camino! 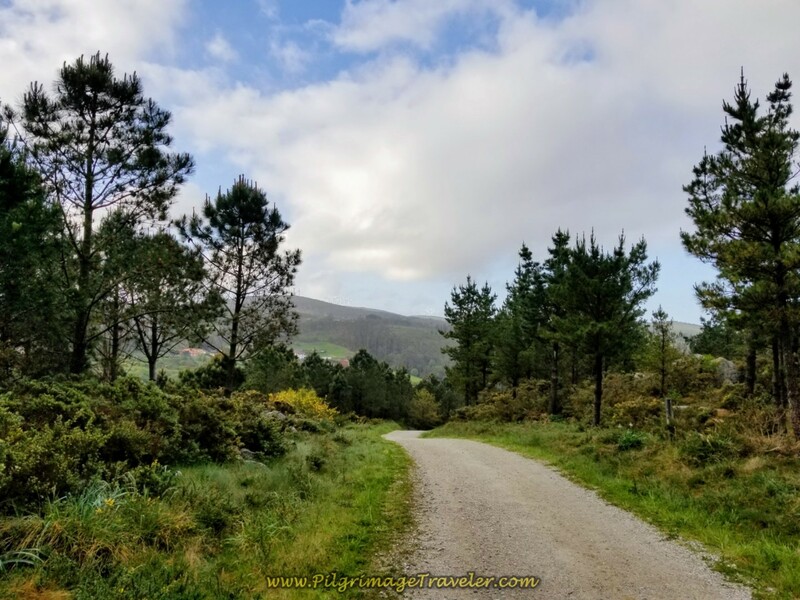 It was along this stretch that Rich and I had a conversation about how the Camino frees you. Period. It frees you of everything; responsibility and other people's expectations of you. The only expectations you have are what you set for yourself and how far you think you can walk! For us, letting go of distance goals are hard to release. We were trying to learn to release this too. It is tricky! Yet we longed intensely to be free of everything! Just like the sun was peeking out, this was a bit of an epiphany, though small as epiphanies go! The landscape continued to surprise us. It is a day of great and lofty views. The mountains to the south are frequently viewed along this stretch. At kilometer marker 21.66, a sign for the Fuente de San Pedro Mártir appears, after about 3.1 kilometers distance from the Capela da Nosa Señora das Neves. 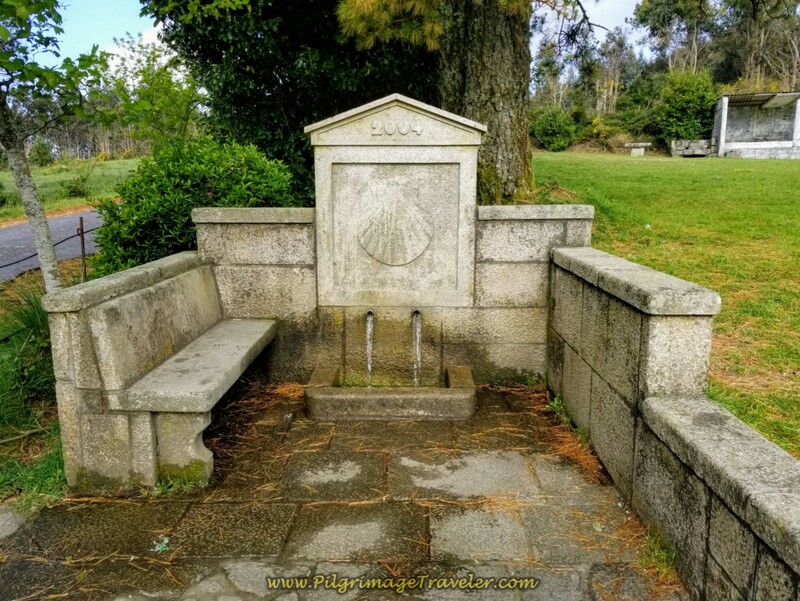 It is a few meters off the Camino to see this fountain and chapel. The fountain is new, built in 2004 and you can safely drink from the water. 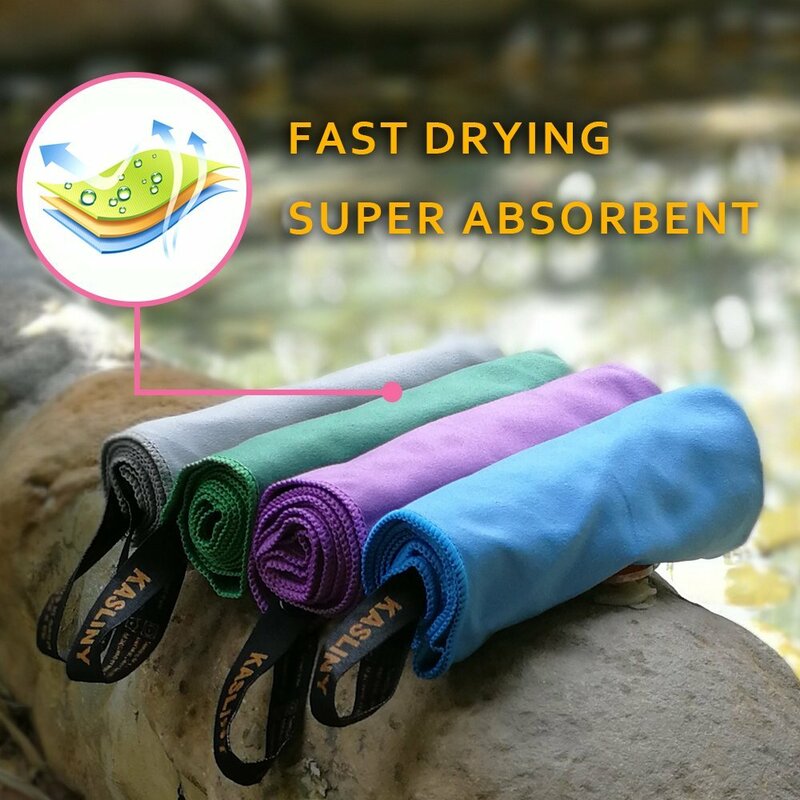 It is said to have healing properties so you may want to fill your water bottles as well! The chapel appears to be quite old, but the inscription states that this extremely simple structure was built in 1878. This would also be a lovely resting and picnic place at 14.1 kilometers into the day - not quite halfway. There is also a small amphitheater-like structure on the grounds that would be a nice rain shelter if you needed it. 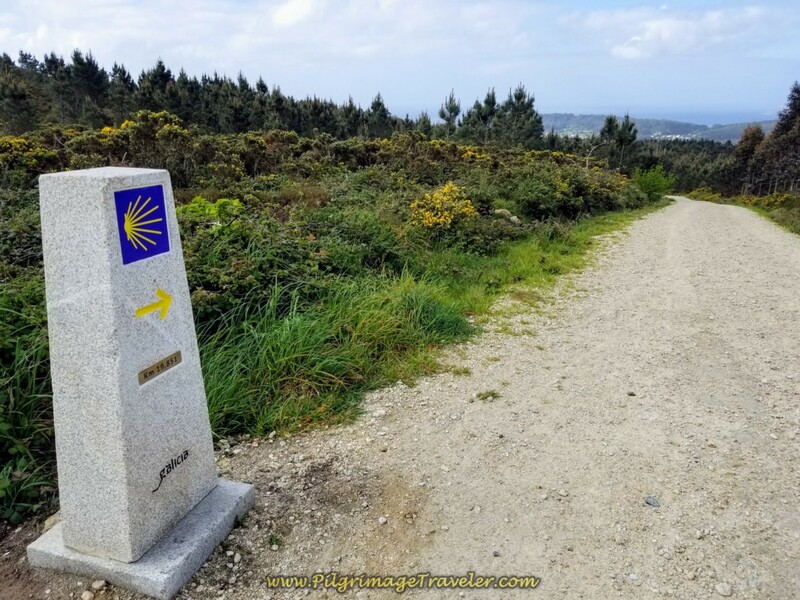 After the chapel, the Camino takes a bend southward and as we passed the 19.85 kilometer marker, below, suddenly, there at last, is our first glimpse of the sea in the distance! 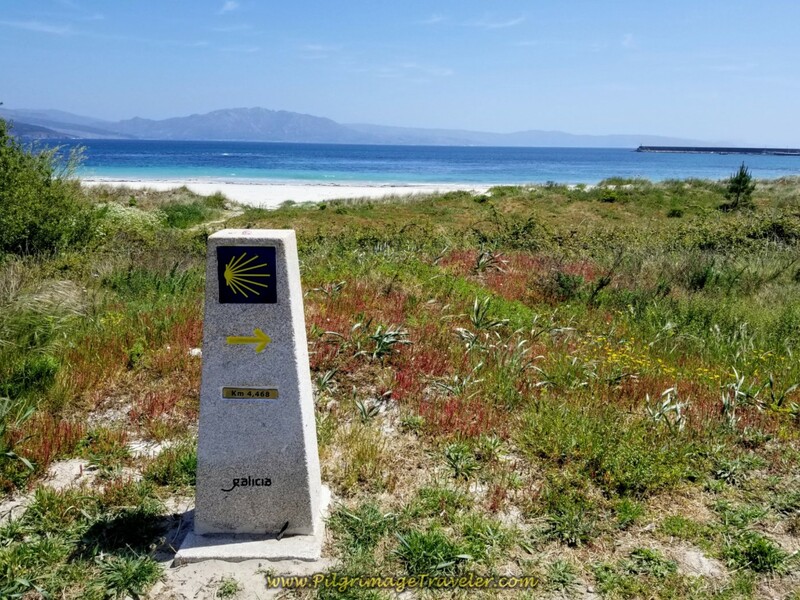 And walking a bit farther on, at kilometer marker 19.6, we caught our first sighting of the peninsula in the distance, the Cabo Finisterre, or Cape of Finisterre, where the lighthouse perches on the cliff. Although you can't see the lighthouse, we knew this was the spot of our final destination. Our Camino is about to take a steep downturn! The cape still looks pretty far away! But we felt a growing excitement being within striking distance! 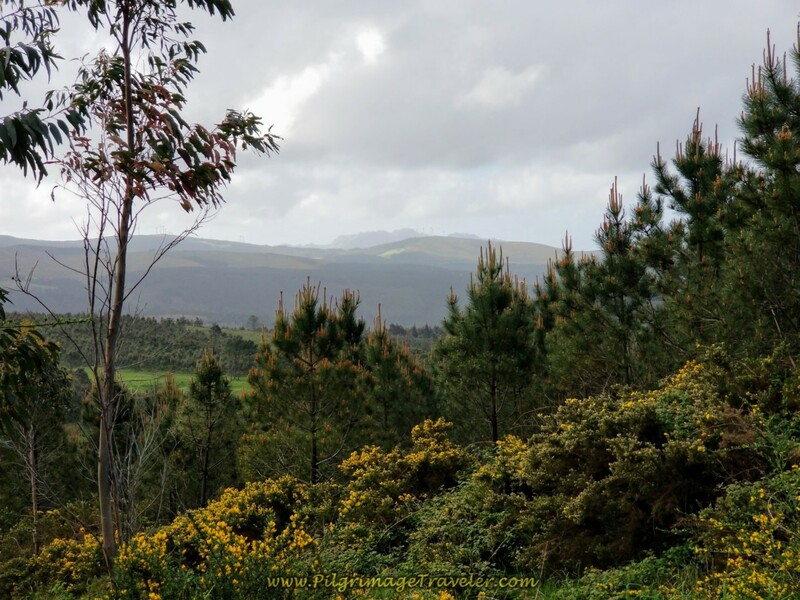 As we walked on, the elevation drops and shortly, the next towns of Corcubión, and Cée come into view. 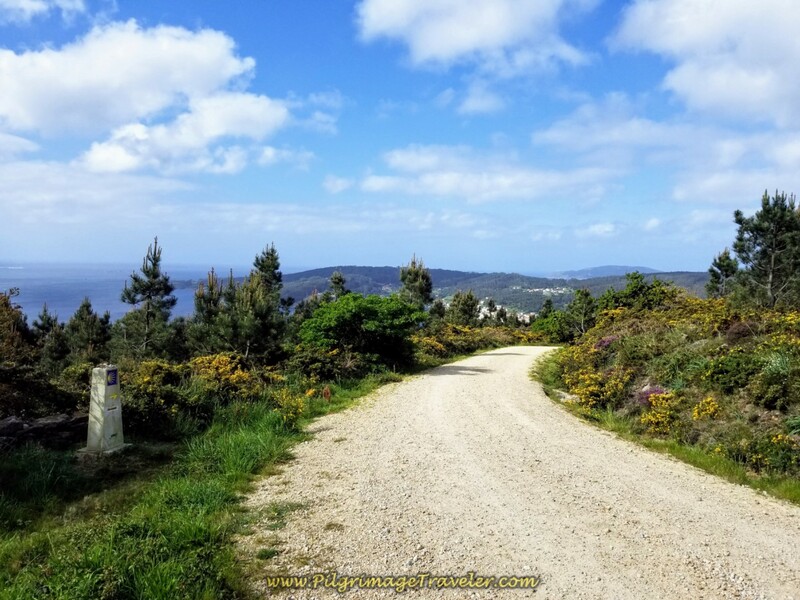 The Camino Finisterre here is very, very steep, with few switchbacks. It is just straight down through here on day three. After many, many kilometers on dirt and gravel lanes, the Way drops steeply until arriving at a T-intersection in Cée. 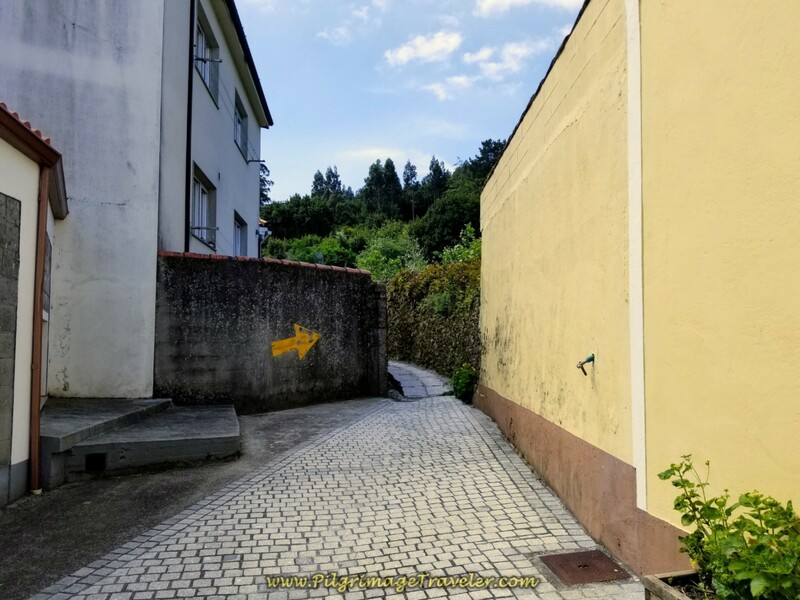 A left turn onto the pavement, shown below brings you into the town proper. 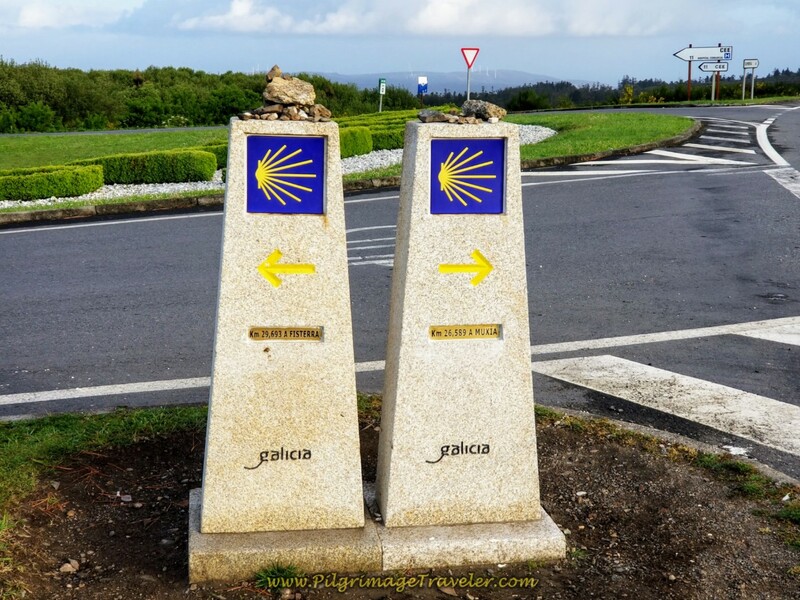 The Camino takes a hard bend to the right at the next intersection. 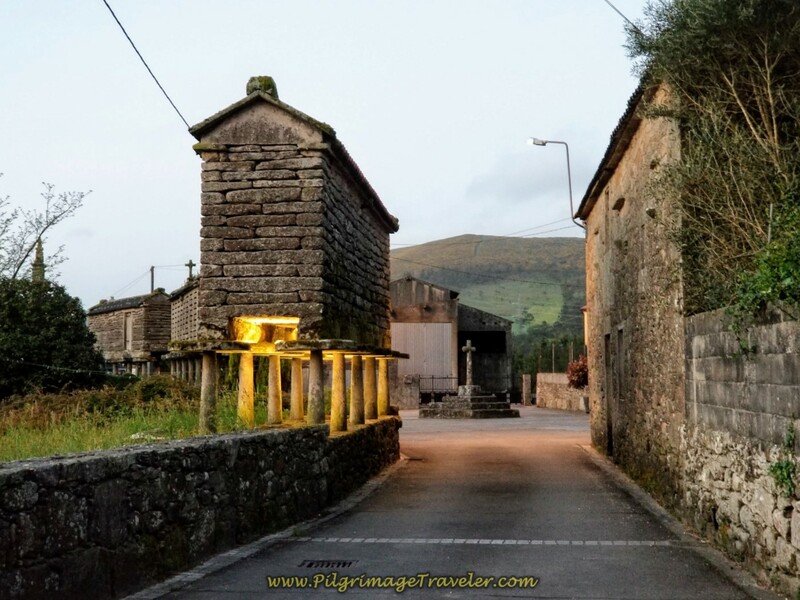 If you turn left instead, you come to the very first accommodation in Cée, a private albergue, the Albergue O Bordón. In 1/4 kilometer, turn right again, then in a few more meters turn right yet again to pick up the AC-550 that goes into town. Pass by the Mar no Camiño on the AC-550 next, a very elegant-looking country home. 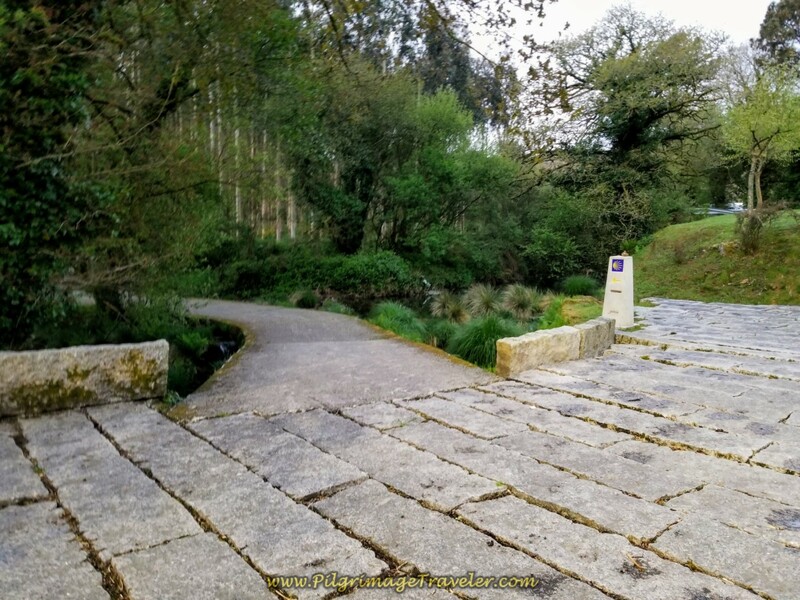 Walk for 3/4 kilometer on the AC-550, then turn left as directed onto the Rúa Campo do Sacramento, then a right after 100 meters onto the Rúa Magdalena, shown below. The streets are narrow and quaint in the center of town. 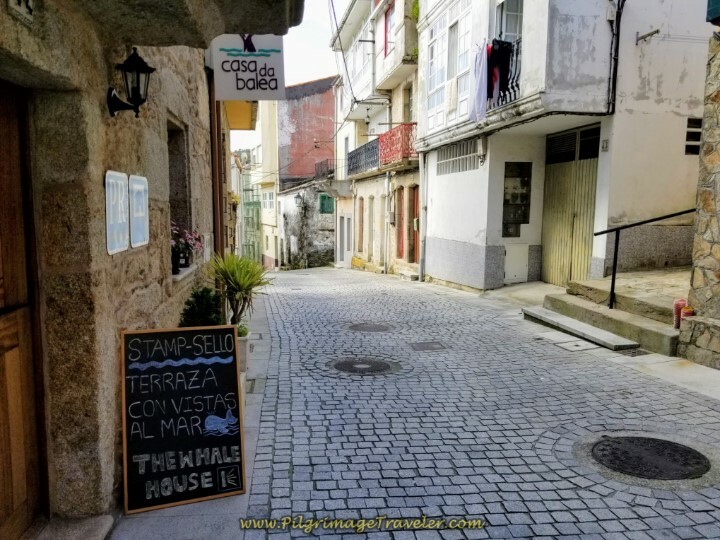 Pass by three more accommodations on this street, the Hotel Larry, the Albergue A Casa da Fonte and the Albergue Tequeron on day three on the Finisterre Way. Just past the Albergue Tequeron, look for a ramp walkway to the left, at this waymark, shown below. 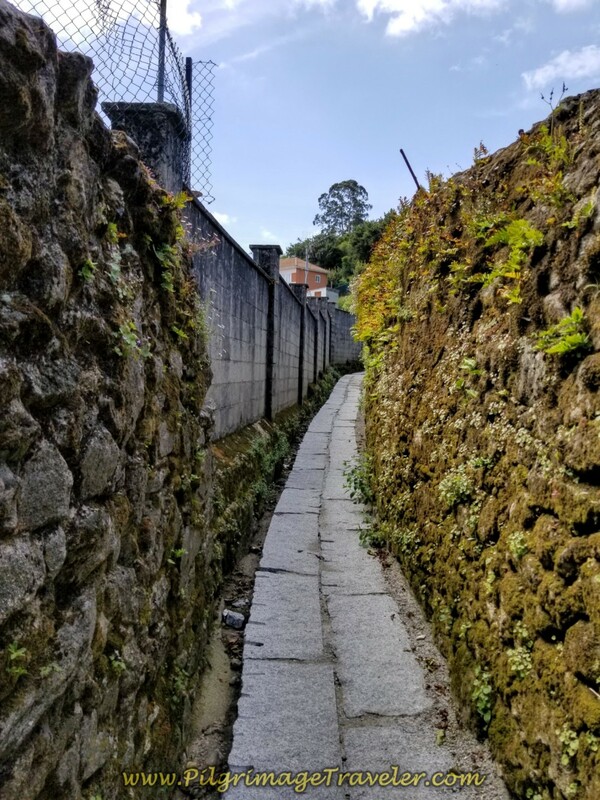 At the bottom of the ramp, a waymark leads the pilgrimage traveler through a clever alley to the Praza Olvido. 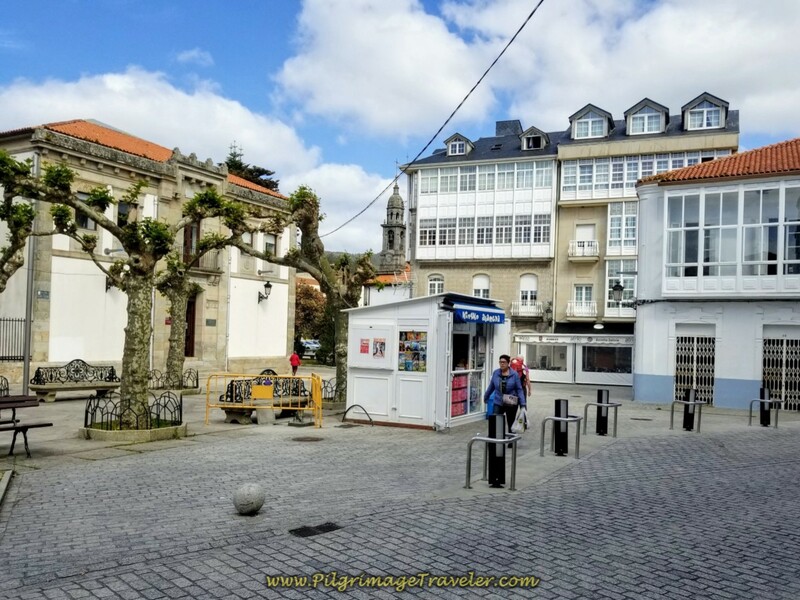 The Camino walks across the plaza and towards the church, the Iglesia Santa María Da Xunqueira, that you can see the steeple in the photo above. 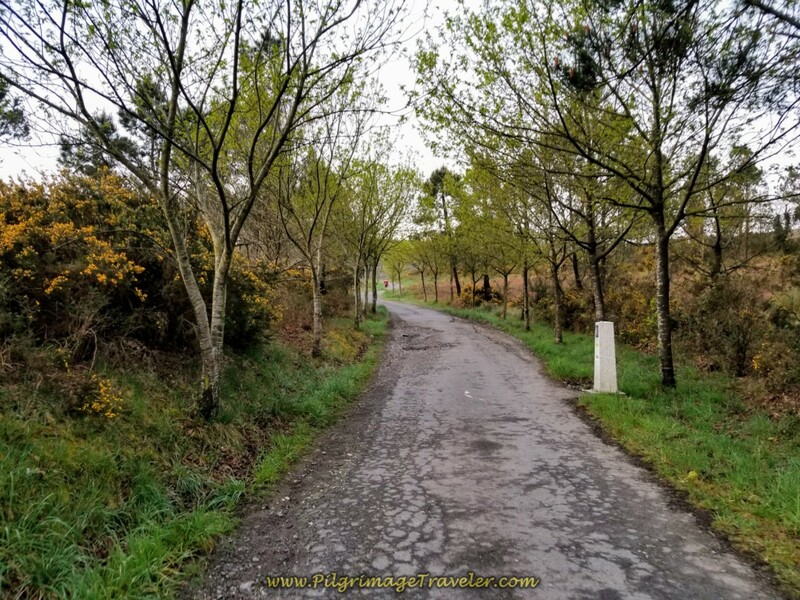 Here is where I have a strong opinion regarding the Camino route from here. The route now goes north through the heart of Cée, past many restaurants on the main square, the Praza Mercado. We had lunch in the plaza and there is a nice supermarket to get supplies as well. However, for no reason that I could tell, other than to walk the pilgrimage traveler by as many hotels and cafés as possible, the Camino goes out of the way to the north, then west, then south once again, making a 3-sided rectangle, as you can see from our geotracks. 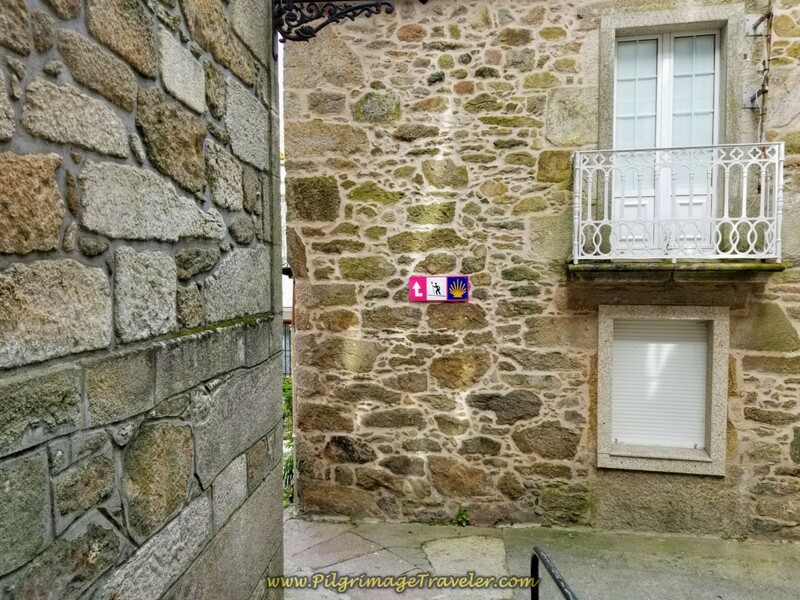 We dutifully followed the well-waymarked route through town hoping to find a great reason for going out of our way, according to the Camino planners. There was no reason. The route through town is unappealing with no redeeming features. Option #1 would be to stay on the Rúa Campo do Sacrament instead of turning right onto the Rúa Magdalena, as described just above. Follow its extreme bend left and southward walking downhill until it meets the coastal road, called the Paseo Alcalde Pepe Sánchez. Make a hard right and head north again along the waterfront, and pick up the coastal park trail to the left when it is convenient. 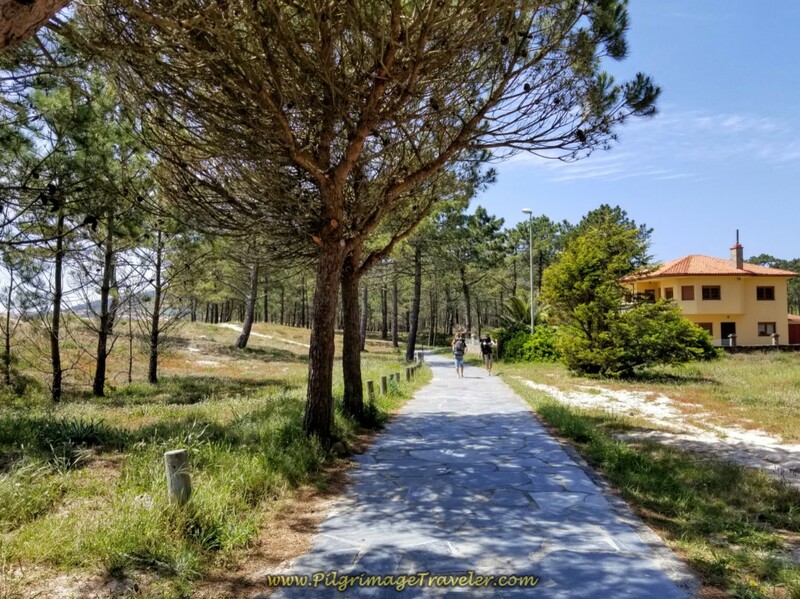 Take the Playa a Concha beach promenade around the bay, staying close to the waterfront, until you see the coastal road on the other side, called the Paseo Maritimo. Leave the beach promenade and head up the hill on the Paseo Maritimo to the AC-445, turning left at the Pensión Beiramar. 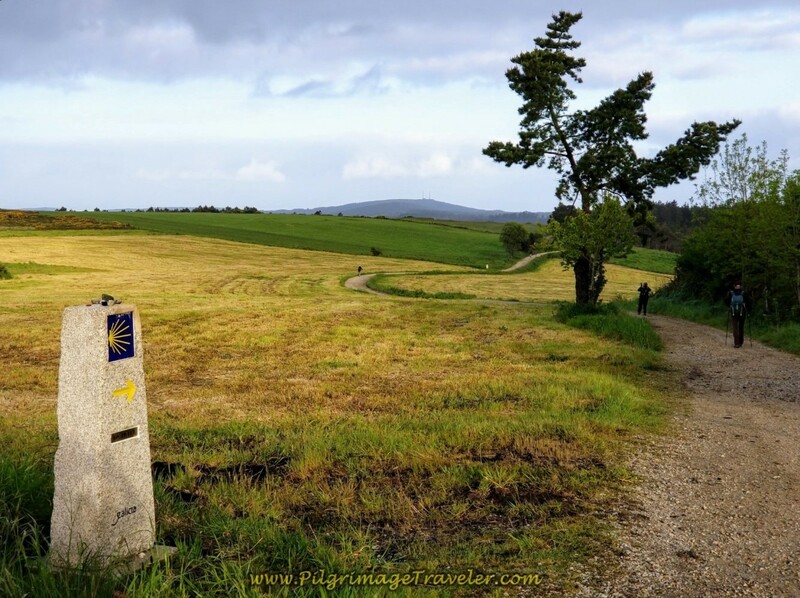 Rejoin the Camino here. (see just below to continue onward). 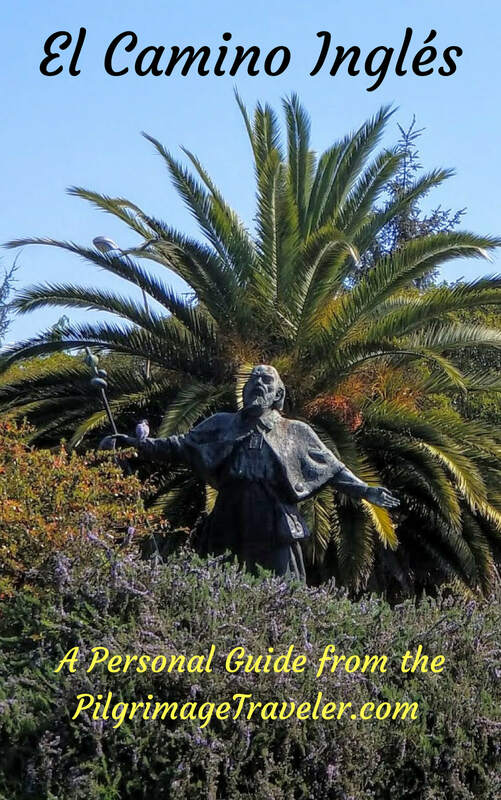 Option#2 would be to turn right onto the Rúa Magdalena, as described above, but instead of turning north and passing the cathedral, head west from the plaza, then take the first street left (south) and you can see the park and the beach ahead. Just pick your best line to the beach, then head right (west) toward the coastal road as described in option #1. If you desire to stay in a nice hotel in Cée, click here for your options or for Corcubión, click here. Either town would be a great place to stay for the night. The small beach, the Playa a Concha is a lovely place to hang out, and so is the waterfront promenade in Corcubión. Next time, I will most likely stay here to shorten day three on the Finisterre Way! 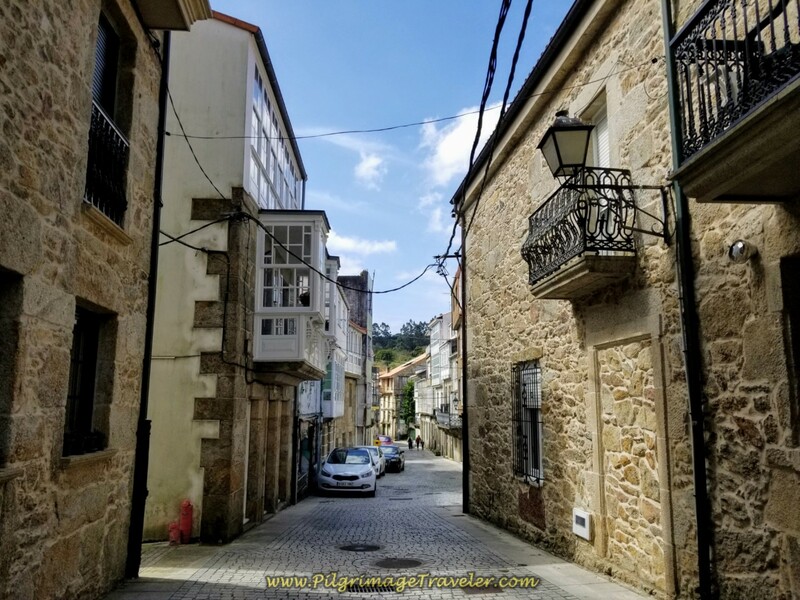 There are so many restaurants and cafés in these two towns, that you will not have any trouble finding one right along the Camino, even if you take my suggested shortcuts. From the main road, the AC-445, on the west side of the bay in Corcubión, starting from the Pensión Beiramar, head south a few meters. 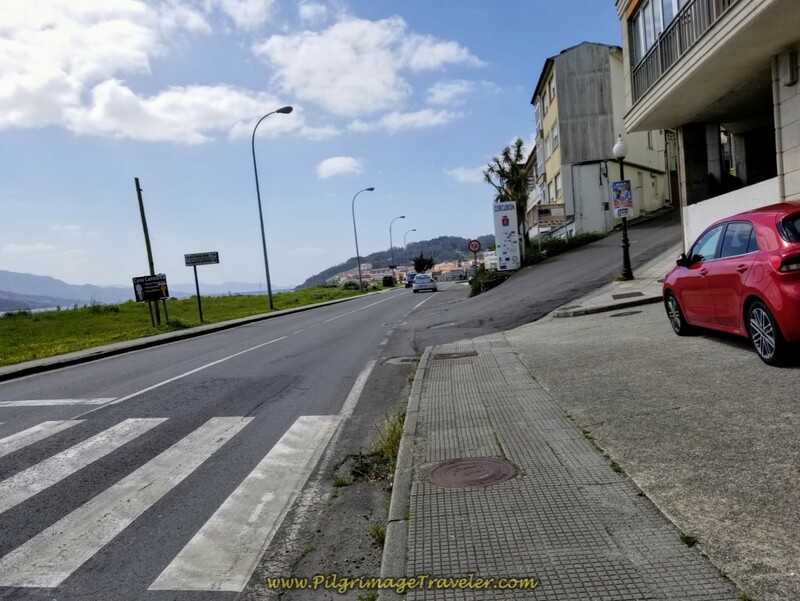 Turn right at the first street by the Corcubión sign, onto the Rúa Cruceiro de Valdomar (which shortly becomes the Rúa Alameda) and head up the hill as shown below. I was reluctant to leave the waterfront, but of course, there is more to come! 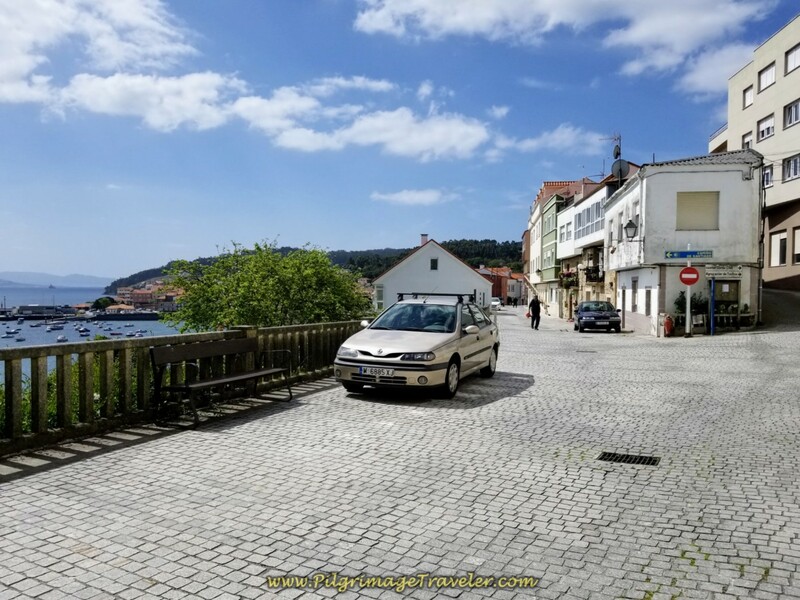 Almost immediately walk by the Albergue Camiño de Fisterra (no website) on your left. Then we caught more glimpses of the sea farther along the Rúa Alameda, below. 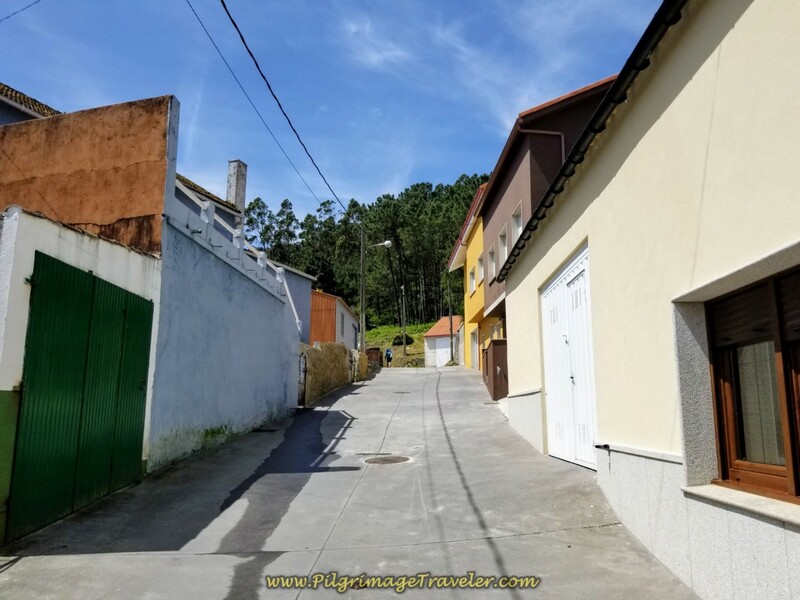 Continue on through town, walking by many amenities, the Casa Laura (turn off in about 200 meters), the Casa da Balea (200 meters more) and the Casa de Carmen (100 meters farther). 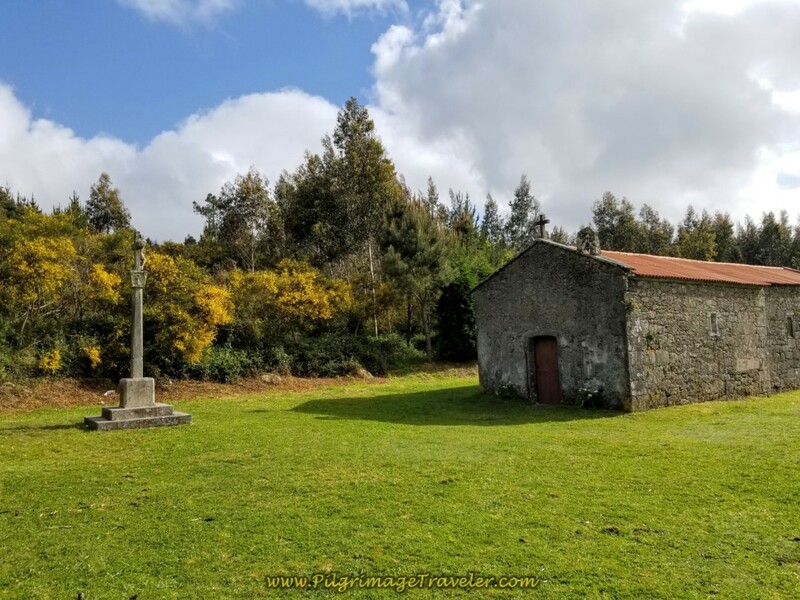 If you can make it another 1.5 kilometers from this area, there is a parochial, donation-based albergue up the hill along the Camino (see below) if this is your preference. Corcubión is also a lovely town with narrow medieval streets. 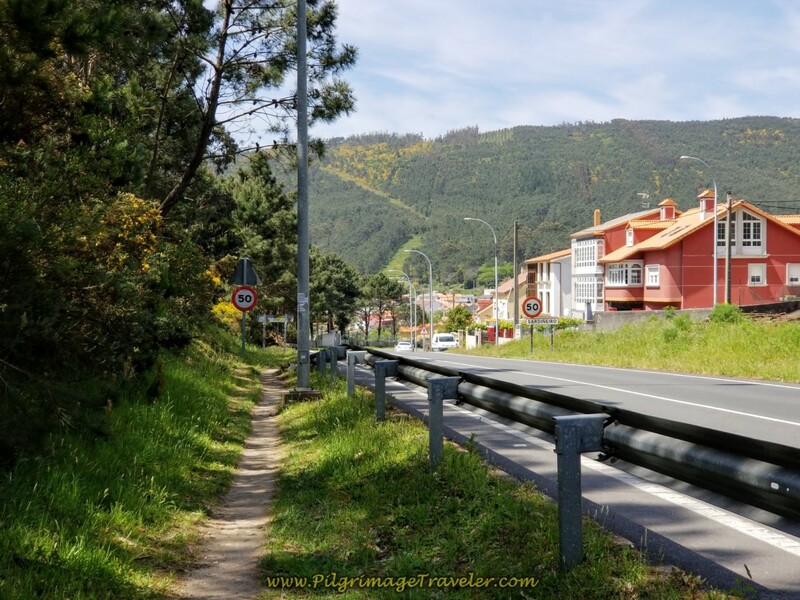 The Camino goes straight on through town for about 800 meters from the AC-445. When you come to a park, shown below, turn right to cross it, following the brand-new signs. All-in-all it is about 1.5 kilometers from the center of Cée to this park. Beyond the park you are directed to find this wonderful passageway system. 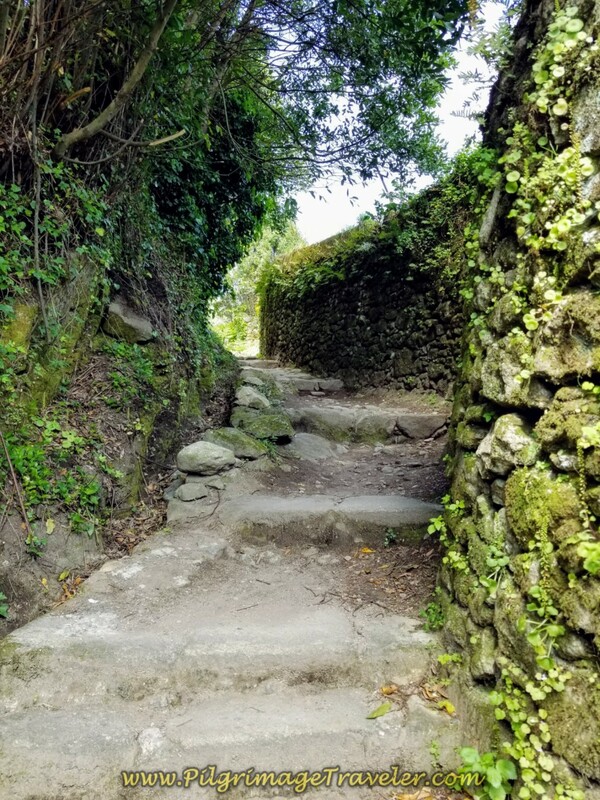 I felt like I was on a magical journey, as the above quote describes, "A turn in the path," that "witnesses a transformation," as I entered and walked through it! 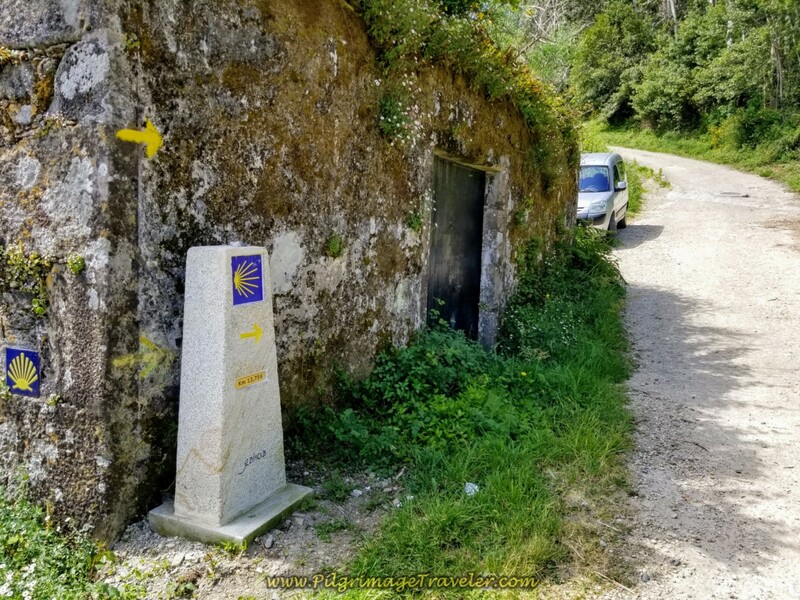 At first I was a bit miffed that the "new" Camino Finisterre led us through Corcubión, instead of up and past it as it was in the past. However, when I walked through this "secret" passageway that was shady through hedges and on old stone pavers, I changed my mind! I was thrilled with the change! 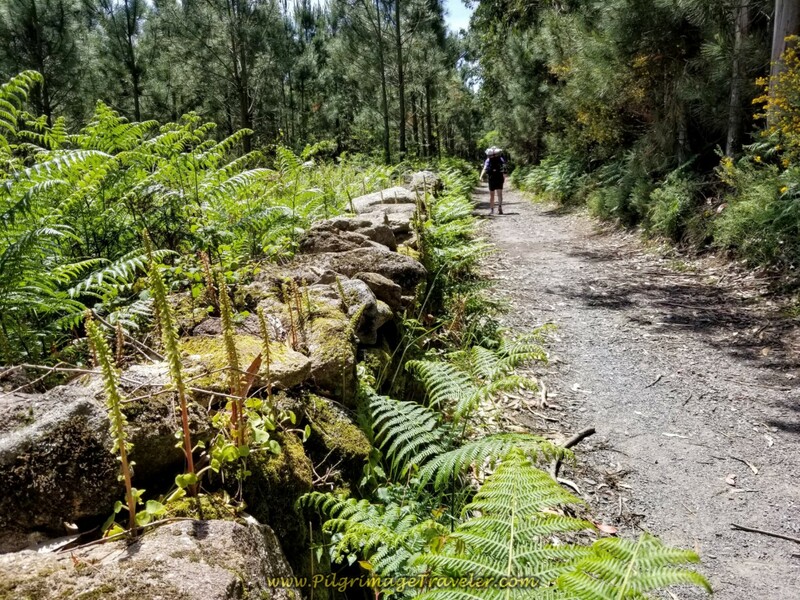 After 400 meters and steep climbing on the secret passageway, the path comes out onto the road, the Rúa Fontiñas, at the 13.76 kilometer marker, and you follow it to the left. 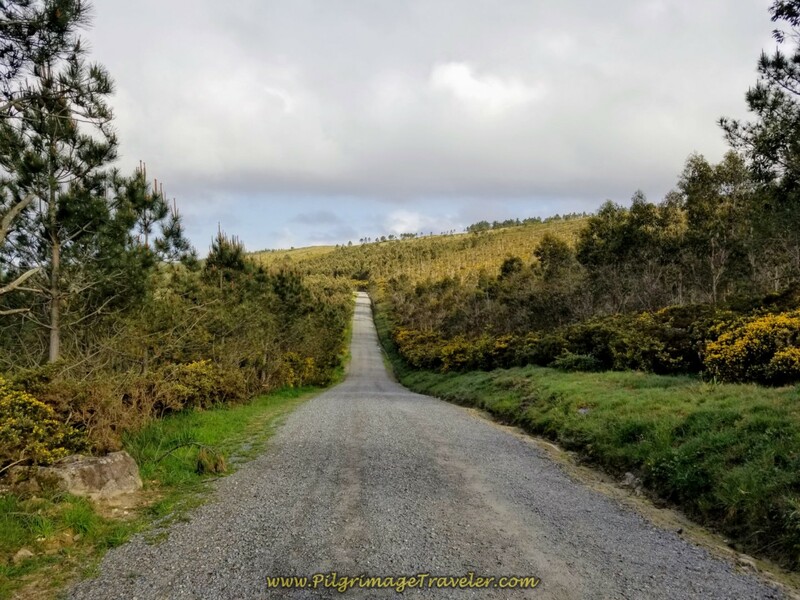 While the climb begins in Corcubión when you enter the secret passageway, you won't notice it until you hit this open road. Don't forget to look back at the views of the bay, according to Nietzsche, "After the effort, the long climb, the body turns around and sees at its feet the offered immensity." After 200 meters, turn left at a T-intersection. Walk not quite another 200 meters and turn right at this intersection, below, onto the Rúa Camiño do Carro in the hamlet of Vilar. There is a fountain, with potable water to your left if you need water. 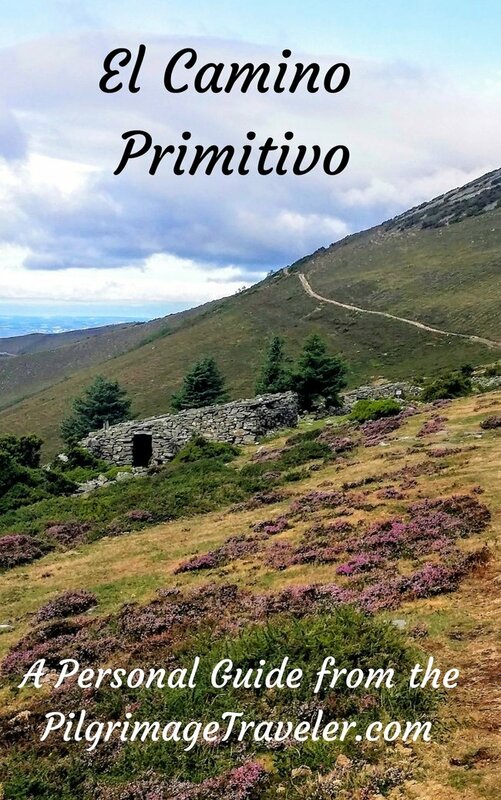 After another 400 meters or so, the Camino crosses the AC-445 to pick up the CP-2801 that takes you in a few meters to the donativo, the Albergue de Peregrinos de San Roque, shown below. Pick up a path to the right of the albergue, at the 12.5 kilometer marker. 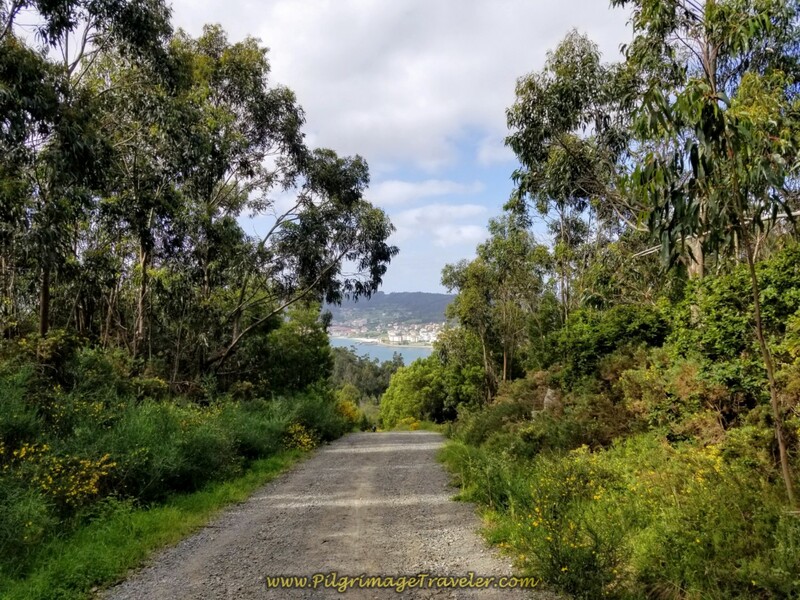 This path parallels the AC-445 as we continue on our walk across the peninsula from Corcubión towards the next town of Estorde. The path walks by this lovely San Roque gate, to someone's property. 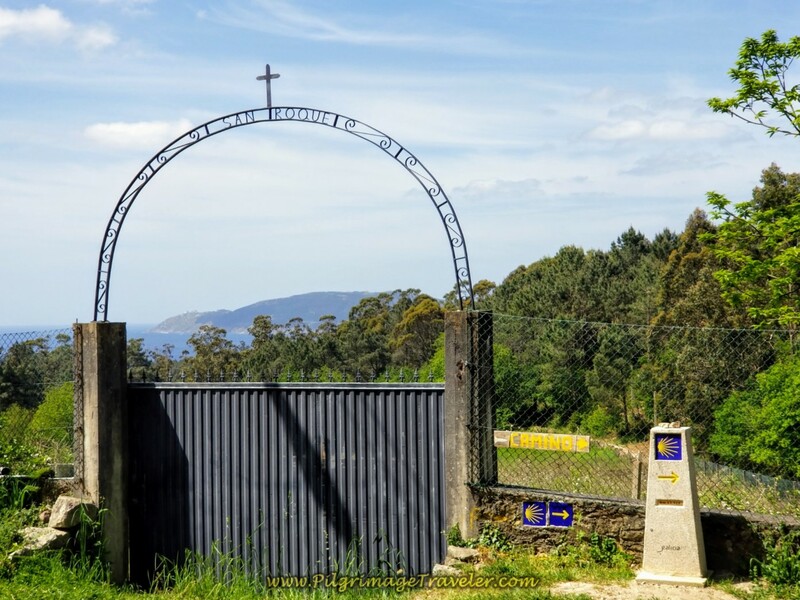 Yes, that is the Cabo Fisterra being framed within the gate. 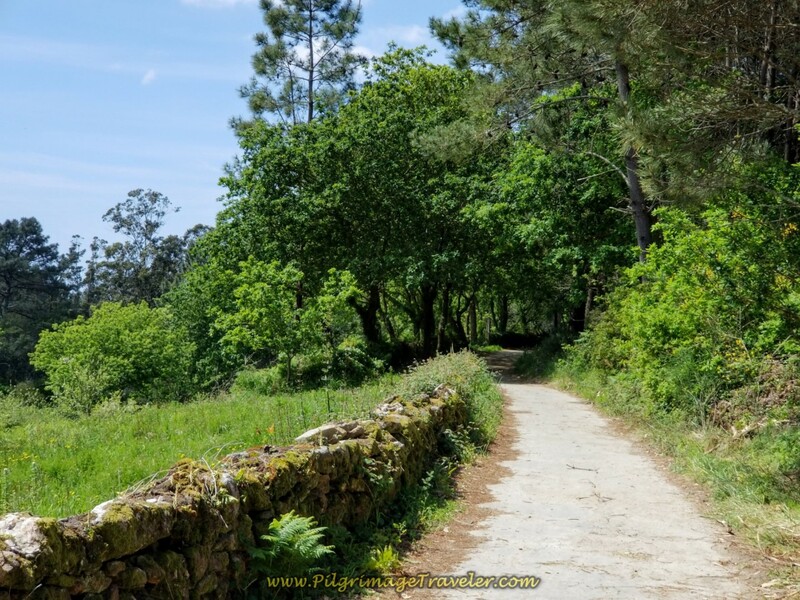 We continued walking across the top of the peninsula on this lovely walled path toward Estorde. The path lasts for about 1/2 kilometer, when it joins the AC-445, to descend on pavement into the town of Estorde. 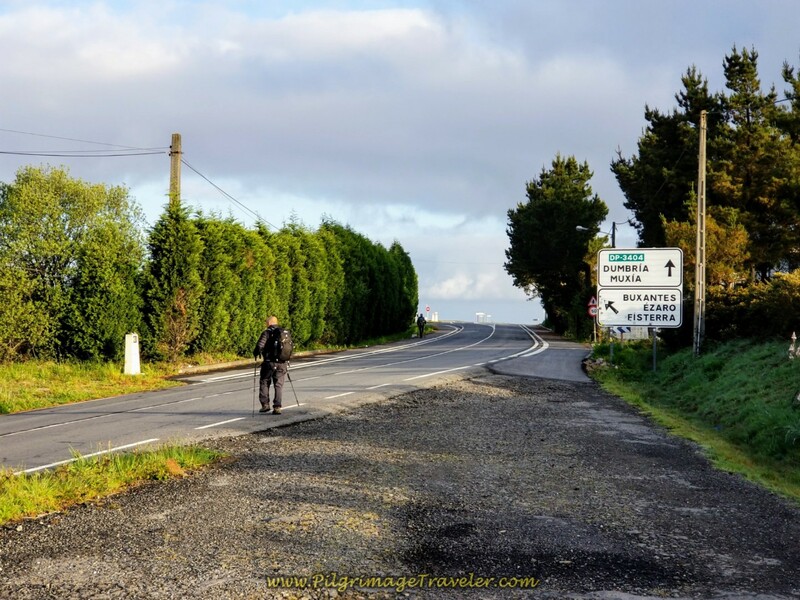 There is a brief shortcut of 1/3 kilometer to the right of the highway, but essentially the pilgrimage traveler must walk on the shoulder of the pavement for the next 1.8 kilometers. Luckily, the shoulder is wide in most places. As you descend into Estorde, you can catch glimpses of the beautiful beach and bay to your left. If this town calls you to linger, there are Estorde accommodations to appease you. We even walked by a camping place. There is a nice café near the beach here as well, if you need some caffeine for the final 10k push. 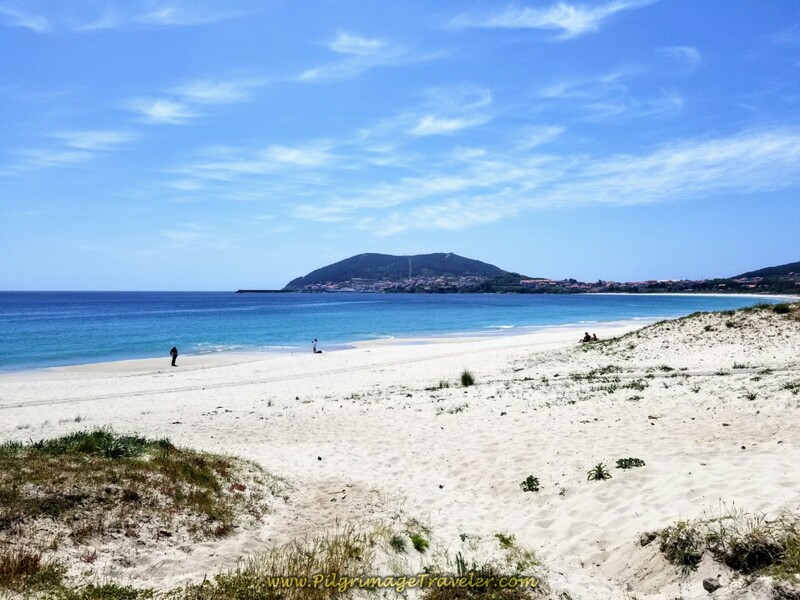 As you pass the beach, the Praia de Estorde, your next destination is the town of Sardiñeiro. It also has a beach by the same name in a lovely little bay. 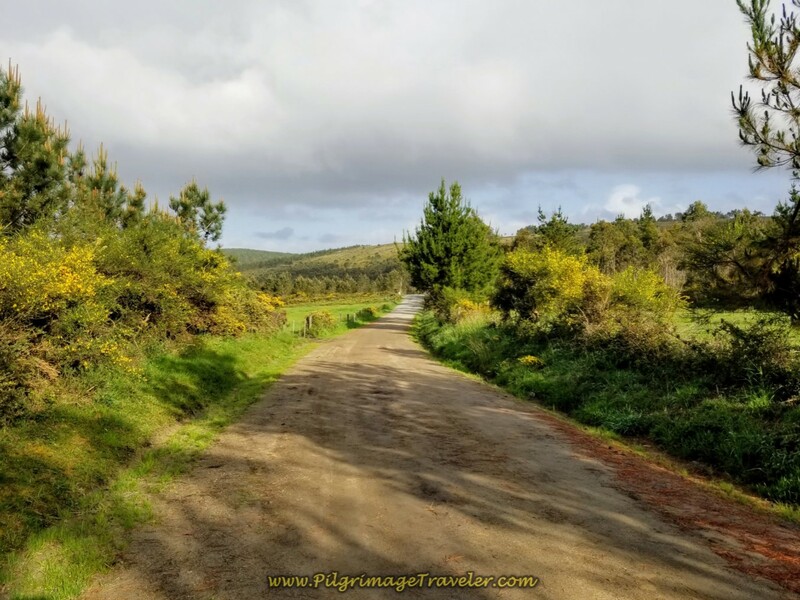 It is difficult to tell where Estorde ends and Sardiñeiro begins, but along the way, the Camino has a nice path to the side of the road. 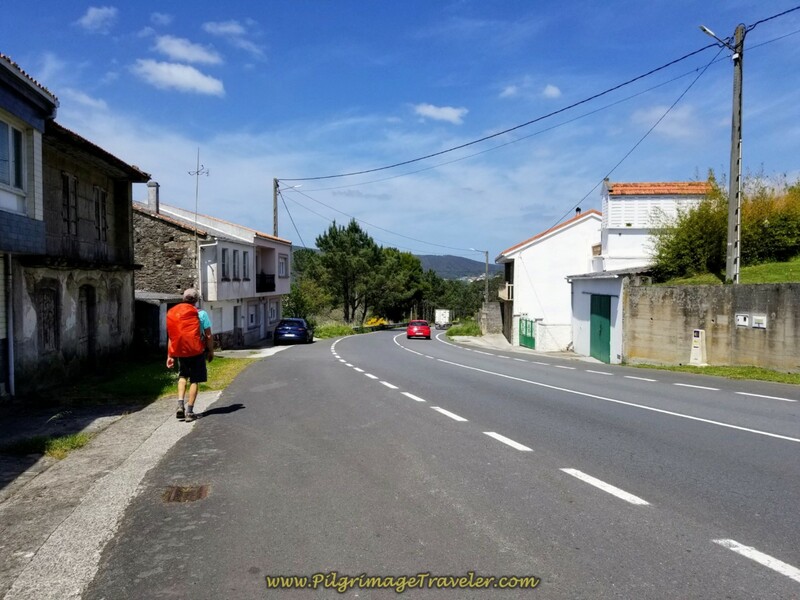 From here onward, for the next one kilometer, the Camino does a nice job of keeping the pilgrim off the highway, as it meanders back and forth on side roads. 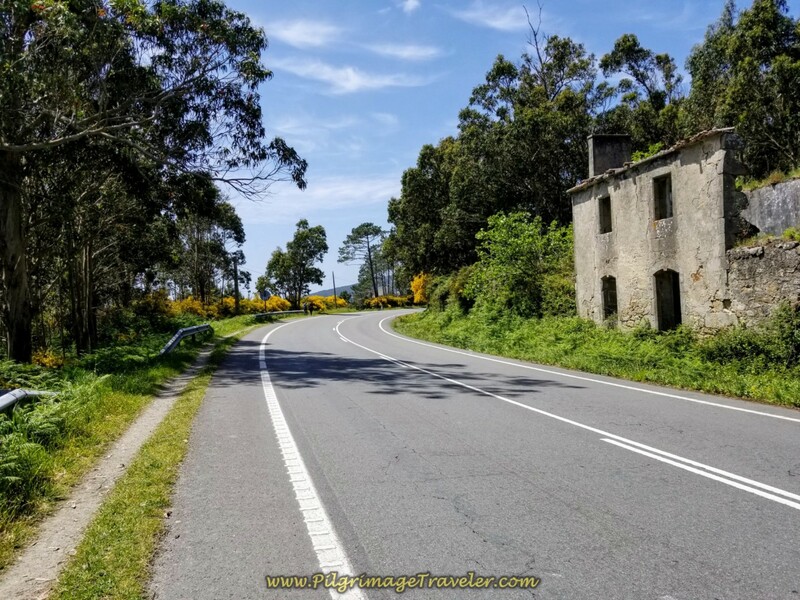 Then the Camino leaves the AC-445 at this intersection, below, and for the final long hill climb, up through Sardiñeiro. 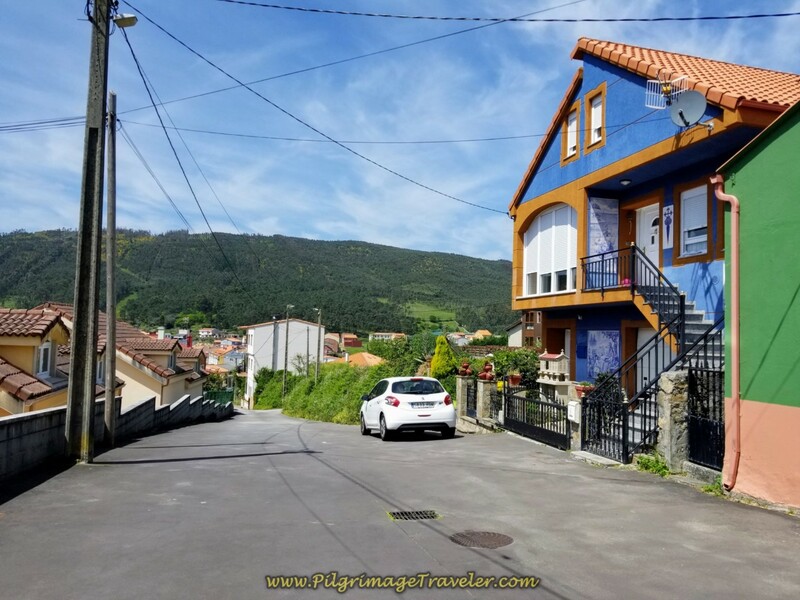 The Camino climbs steeply up a back street of Sardiñeiro called the Rúa Nova. 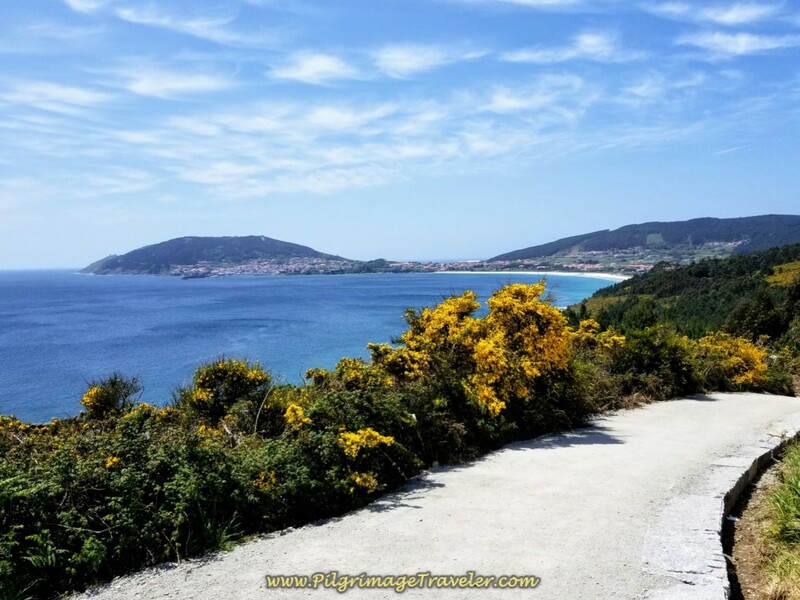 After 150 meters along the Rúa Nova, the Camino turns right onto the amazing Rúa Fisterra as it continues to climb. 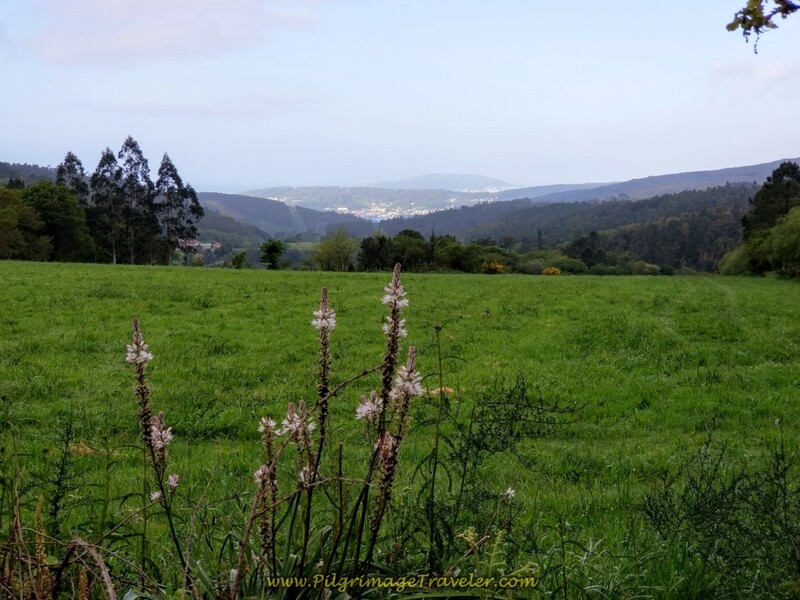 As you leave town, the views open up of the bay as the Camino follows its line southward. 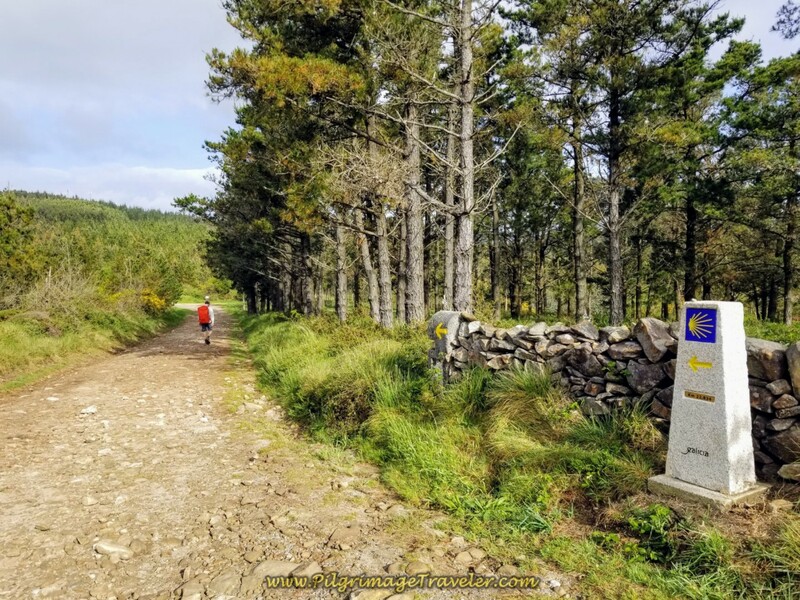 The Rúa Fisterra continues for a full 1.7 kilometers, through the forest, below on day three of the Finisterre Way. This path is a glorious place to be in the spring. Then up ahead as we neared the end of the 1.7 kilometers, you could see that a stunning view would open up ahead! "... these final exclamations where something else is unveiled, the secret of a discovery like a new landscape, and the jubilation that accompanies it." 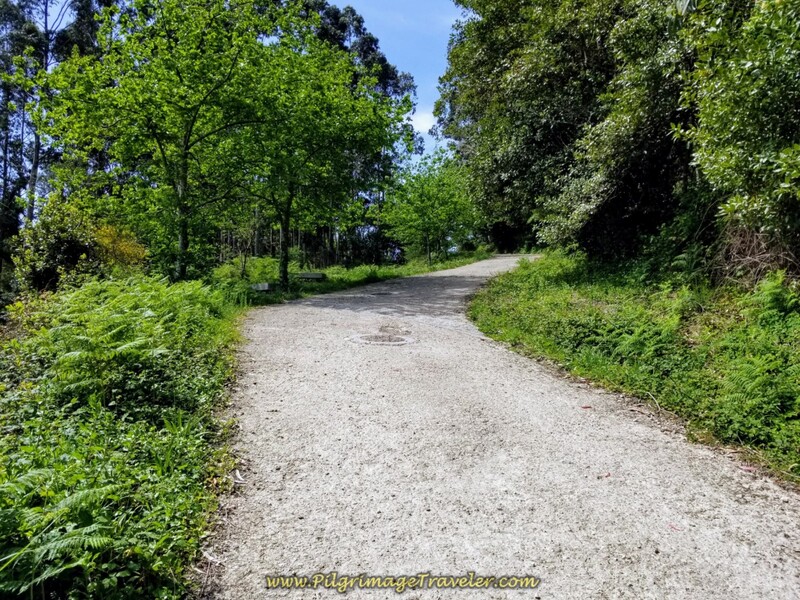 It is not quite another 100 meters on the Rúa Fisterra when the road ends, the Camino crosses the AC-445, and picks up this improved path, shown below. 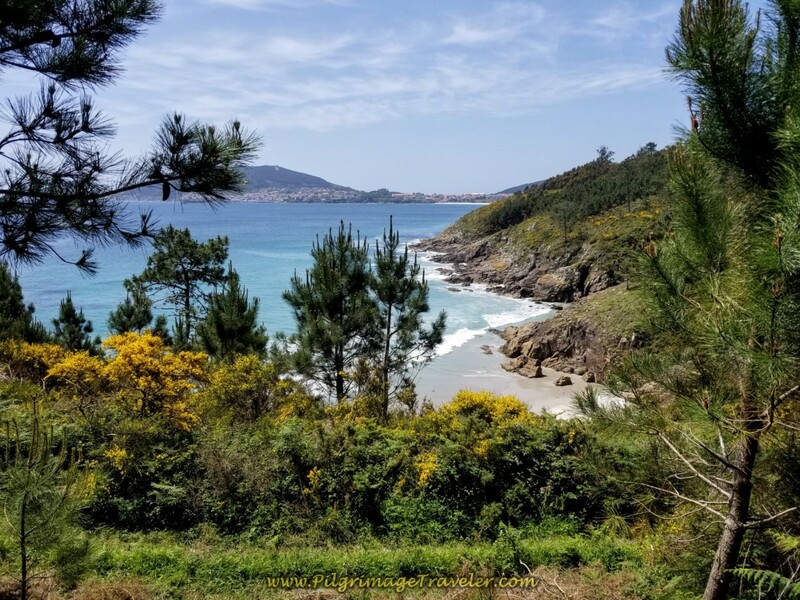 In the short 350 meters on this path, it descends very steeply to the Praia de Talón, a gorgeous and inviting little cove. 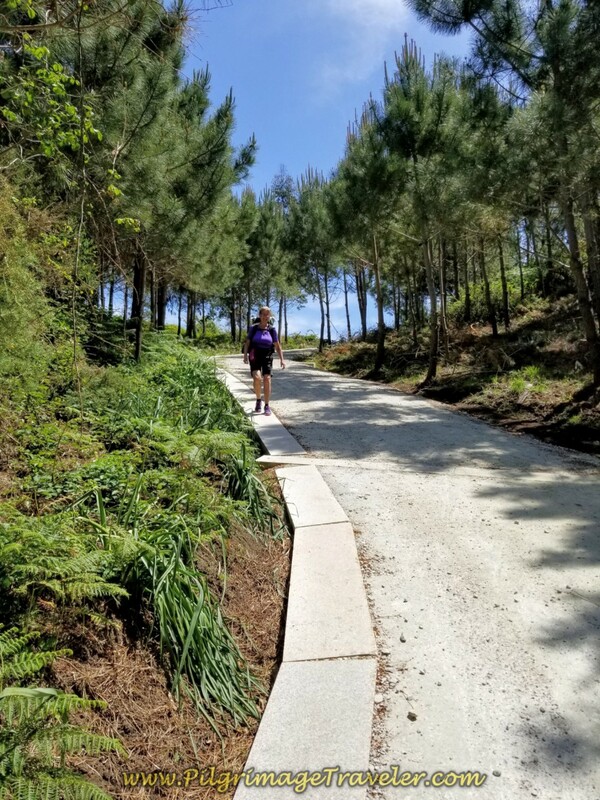 After the steep climb from the beach, you briefly join the AC-445, turning left and walking on it for 300 meters, shown below. Then it's another turn to the left onto a paved side road for another 300 meters. 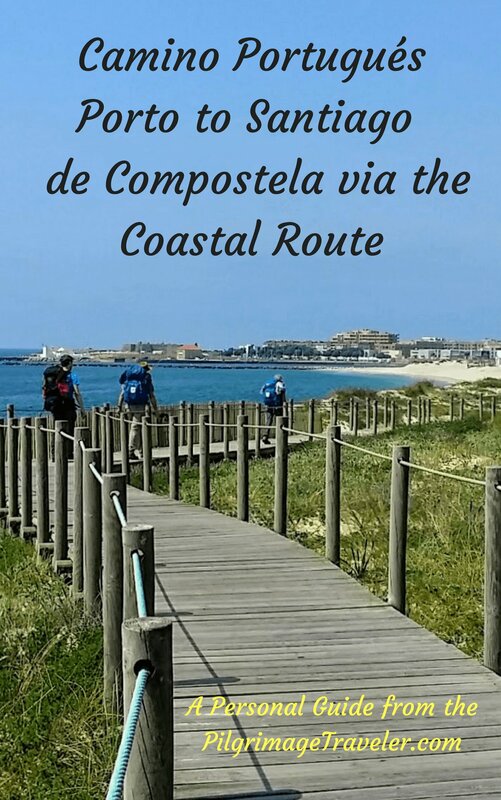 Next, you pick up the final long paved path to Langosteira (Lobster) Beach and Finisterre. 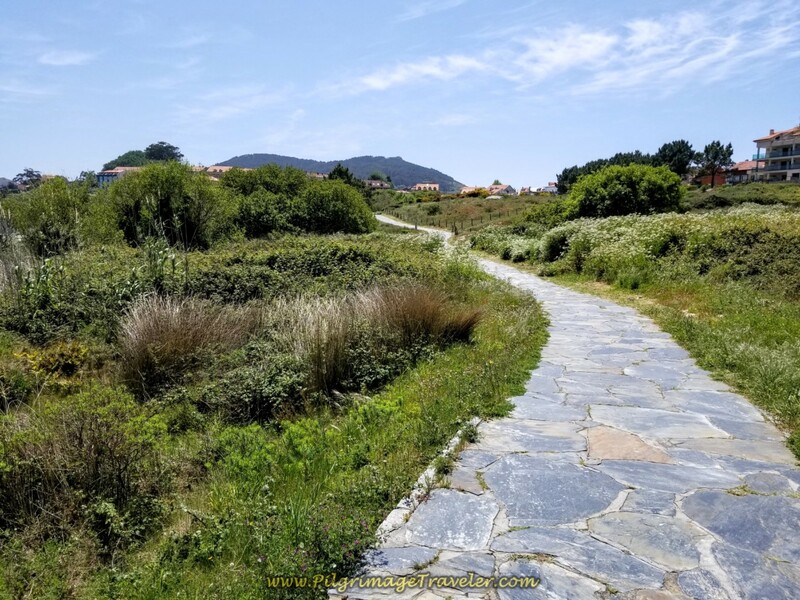 After reaching this paved path that runs the entire length of Langosteira beach, the view of the beach and Cabo Fisterra are fantastic! 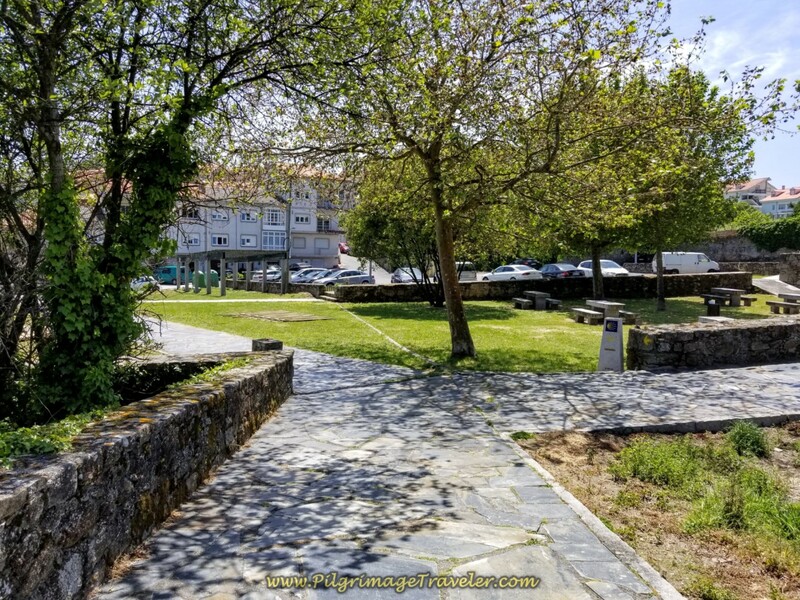 Once you get onto the path, shown below, and into the inviting park, you still have a long way to go to get to the actual town of Finisterre, approximately 2.8 kilometers! This can be a discouraging walk, because Finisterre on the other side of the beach is visible for such a long way. Some pilgrims chose to walk on the beach itself instead of this path, but it is a long way of difficult beach walking, for which after 30 kilometers, I did not have sufficient energy. 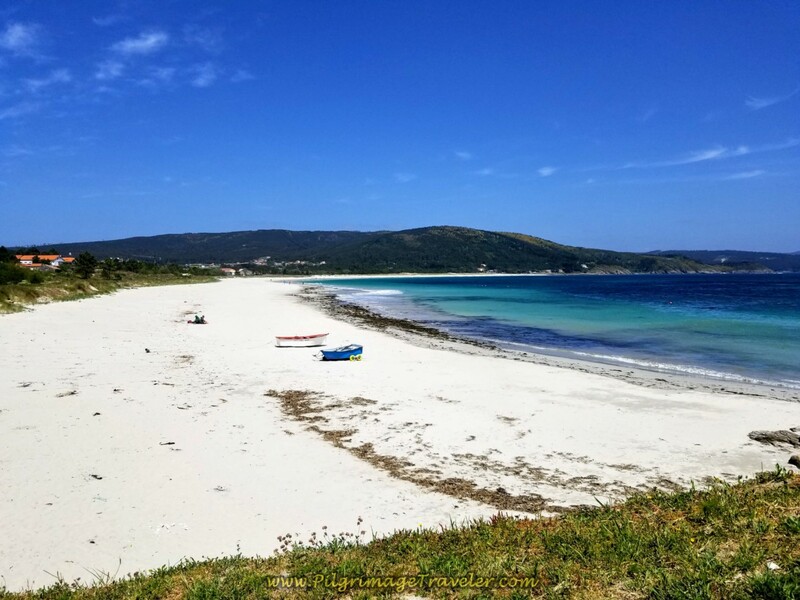 Do, however plan for some time on this beach during your stay in Finisterre. Especially during beach-weather months. It is a most glorious place! 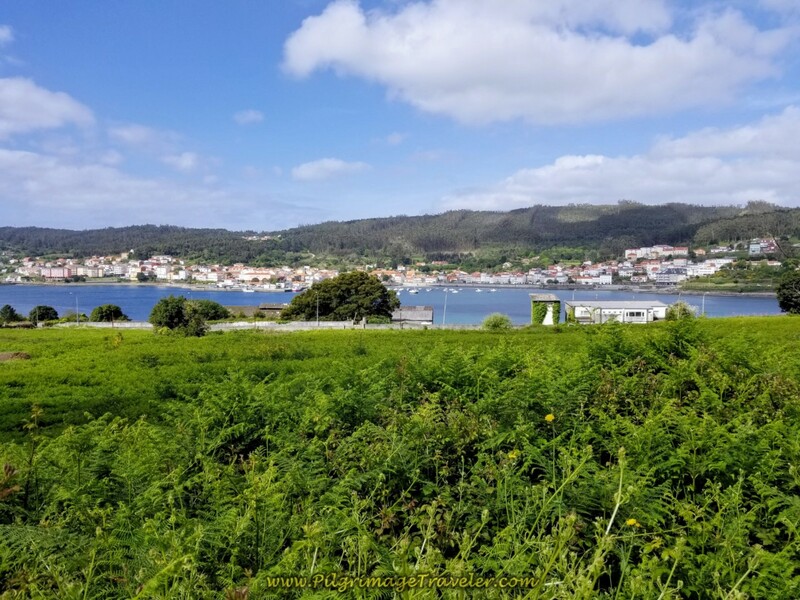 After crossing the beach, as we entered town, we passed in front of a beach-side café bar and climbed this small hill, shown below, to see the famous cruceiro ahead. 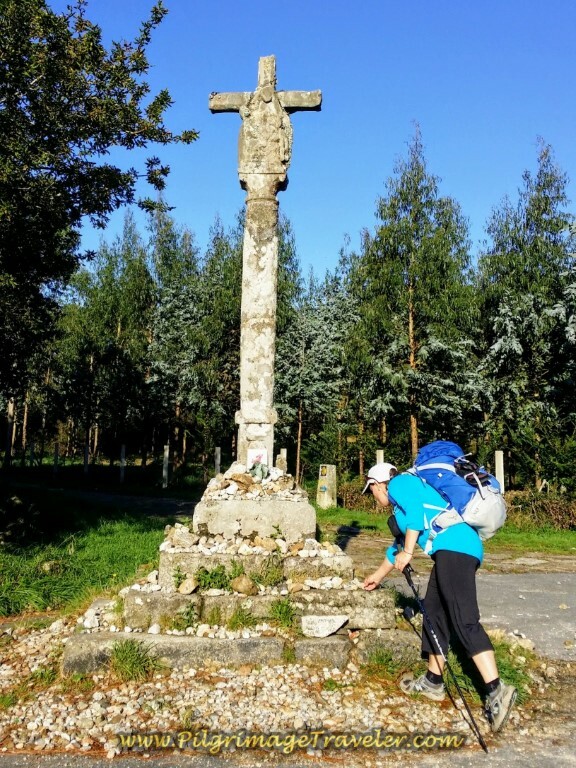 It is at this cross, called the Baixar Cruceiro that the Way to Muxia begins, so it is an important landmark to know! 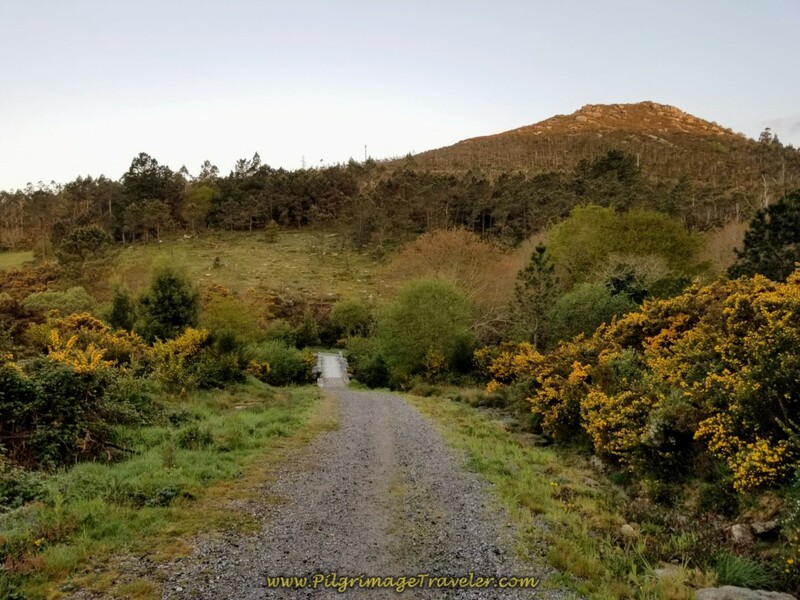 This is where I end our journal of day three on the Camino Finisterre. We still have the final 4.0 kilometer walk to the lighthouse that I call from the Cross to the Cape. We did walk on through town, to our pre-booked hotel. When we arrive at major cities, we almost always forgo the albergues. 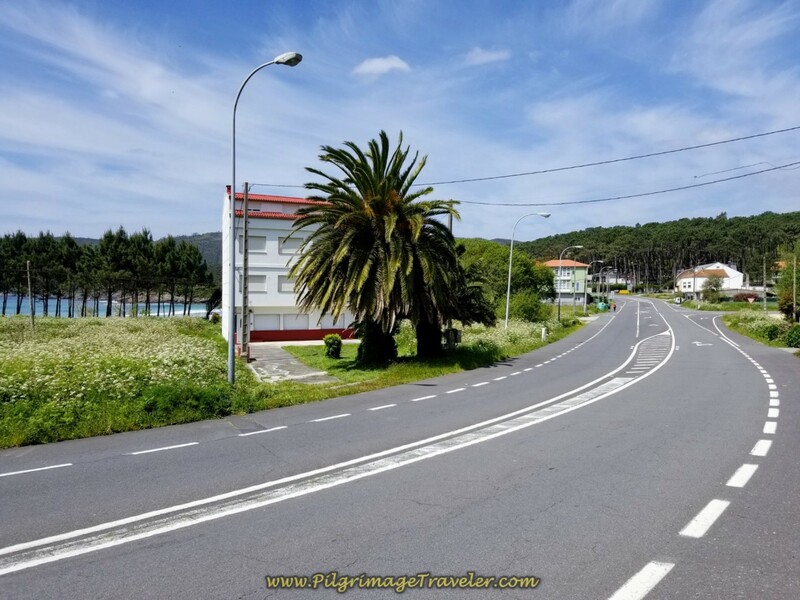 There are many, many hotels and albergues in Finisterre. Click here for the booking.com list. 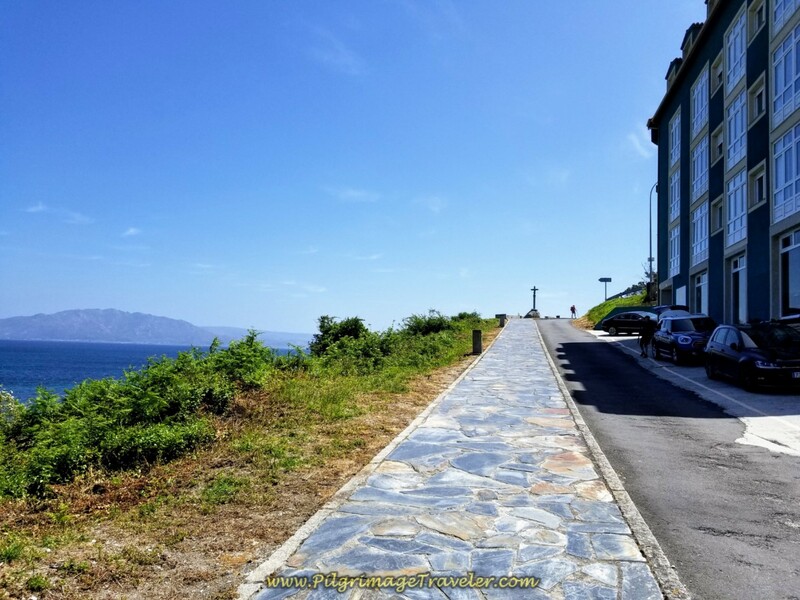 We have stayed in the Hotel Cabo Finisterre and the Hotel Ancora, both mid-range and comfortable places. Thank-you for booking through our website. 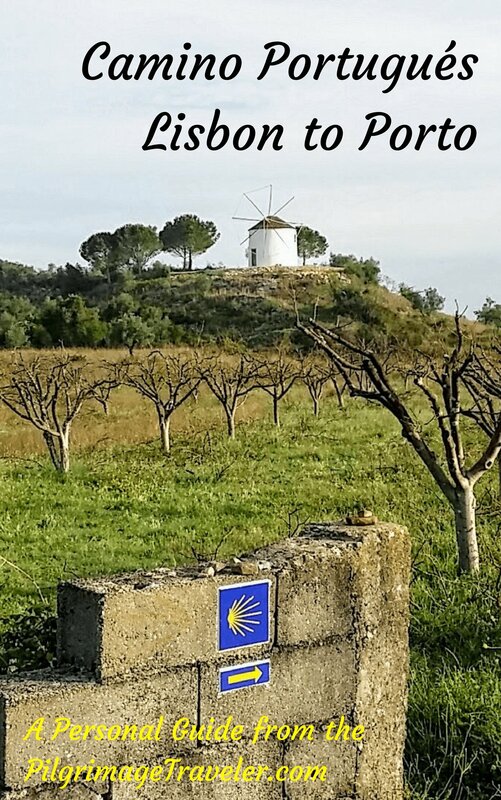 There is one municipal albergue, just beyond the Baixar cross, that I have placed on the map above. It will not take reservations, and only has 36 beds, so arrive early if you plan to stay there. Some of the private albergues will take reservations, but a lot don't. 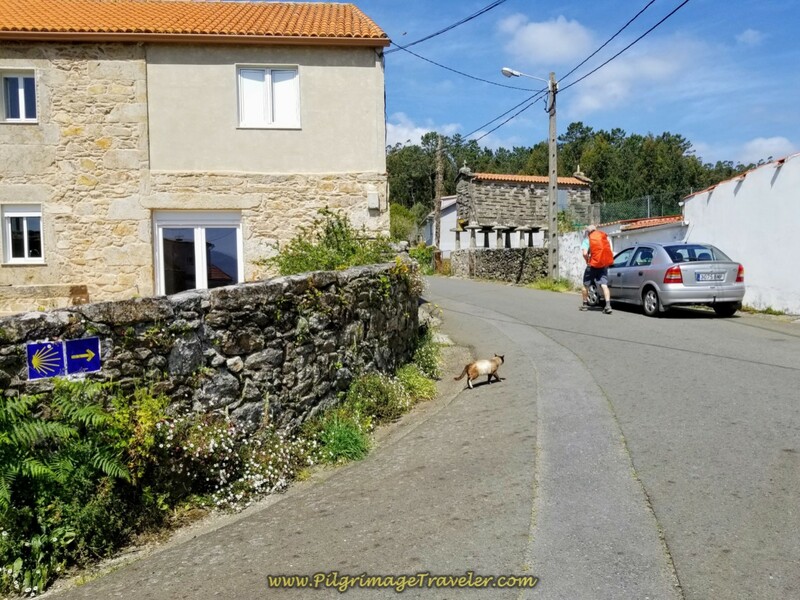 If you go to our Finisterre Booking.com link you can see the ones who do. There are also, many, many restaurants and cafés here as well. We especially enjoy eating along the waterfront, and sometimes a glorious sunset will accompany your meal, unless of course, you are out at the Cape! As the title of this section suggests, despite the length of this stage, I have always walked the entire day with awe and wonder. I truly love the seacoast and the never-ending high vistas that this day affords. The dramatic coastline in this area is the stuff of folklore and romanticism for sure. I could feel the energy of the place. For me, this day to the End of the World is always a freeing day, one where Rich and I even managed to be free of pushing ourselves. We didn't have to. The joy in our feet, lifted us along as our strong desire to reach the End of the World guided us. 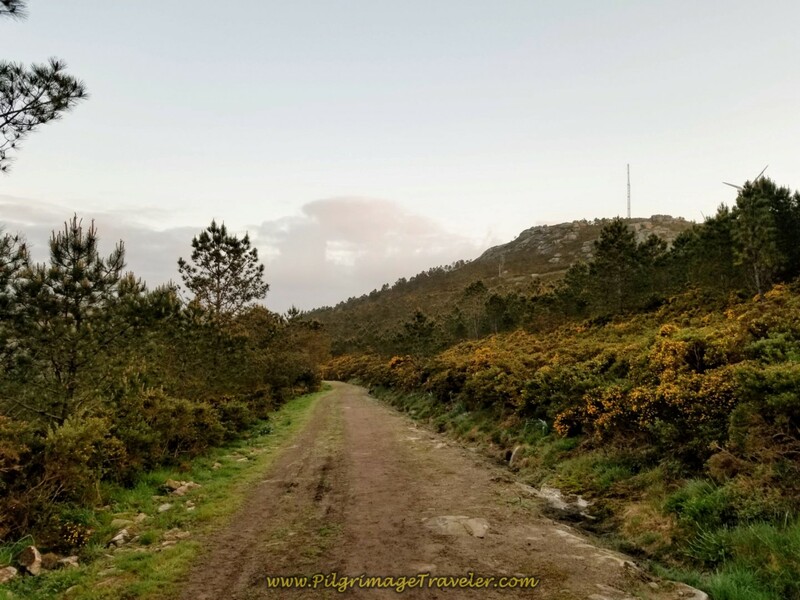 We spent a few hours in Finisterre checking in, resting, getting some food and libations to celebrate the journey, and then, on the same day, we had the energy to walk the final four kilometers to the lighthouse for wine and cheese at sunset. Please click here to follow us to the Cape! 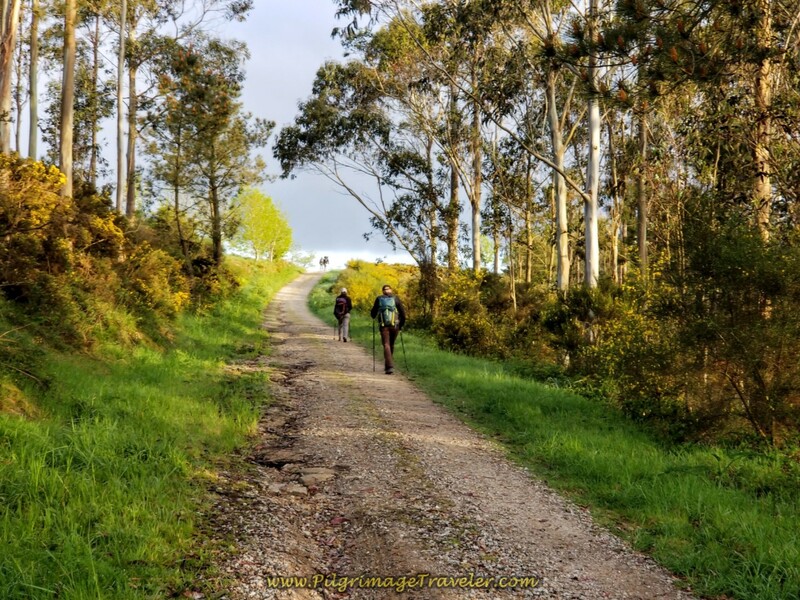 May your own day three on the Camino Finisterre be filled with discovery and wonder at the ever-changing landscape. 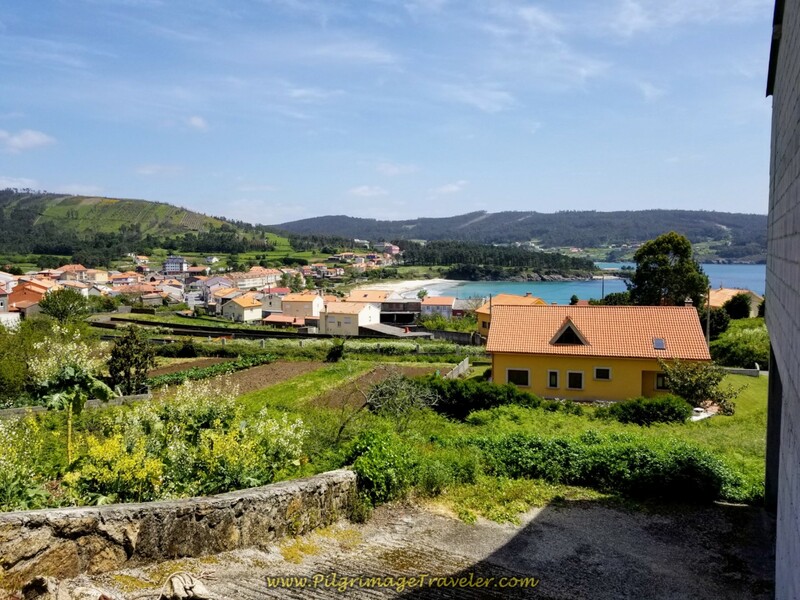 It was a fabulous day from Olveiroa to Finisterre, all 32 kilometers of it! 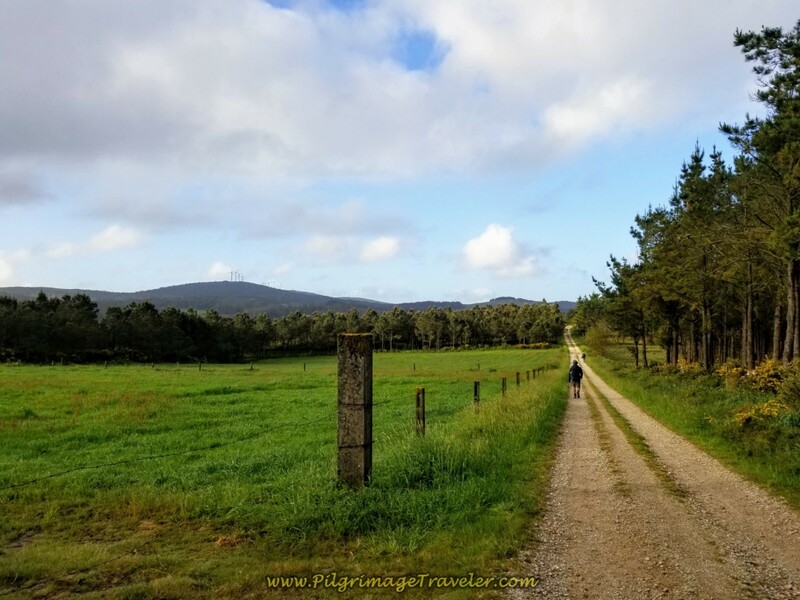 This day is one of my absolute favorites, on any Camino I have walked thus far. 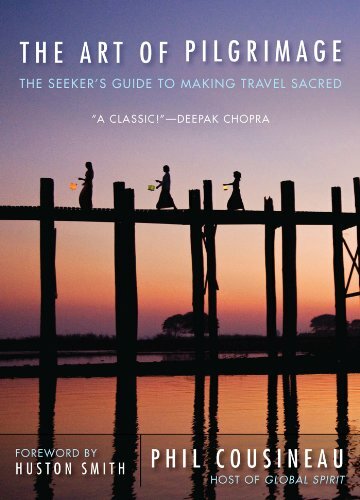 May your own pilgrimage to the End of the World be as rewarding as you walk your own Way! 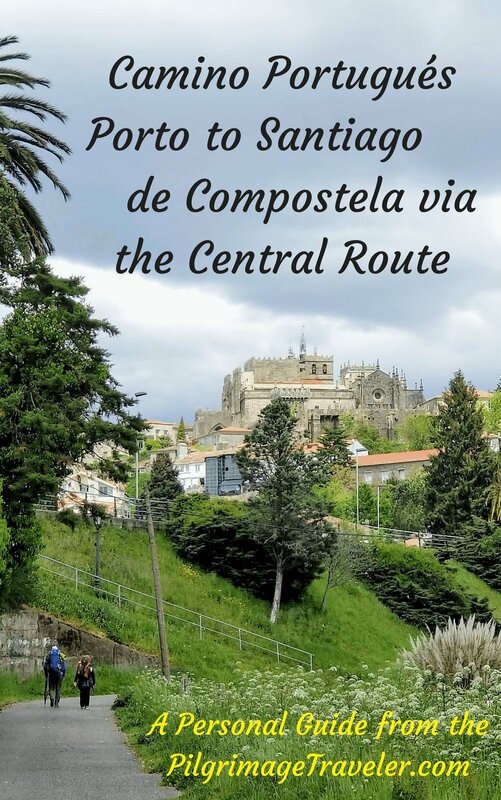 New and updated in November of 2018, our Camino Finisterre Personal Guidebook, including all the recent route changes! Now includes the northern route to Muxía as well! Click here for your copy! Don't carry the weight of a book, carry our digital eBook instead! 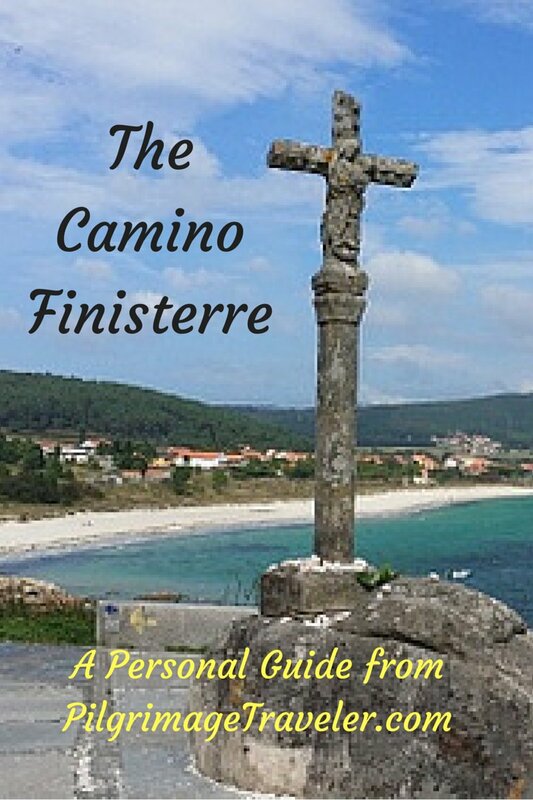 Downloadable Camino Finisterre eBook in PDF Format ~ Get Your Copy Today! 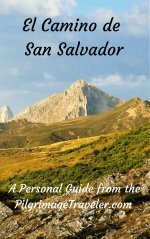 Downloadable Ebook in PDF Format - Get Your Copy By Clicking Here!